A belated Happy Christmas to everyone! I didn’t get chance to sit down with my iPad in the two weeks running up to Christmas as things were so hectic here, what with hosting for two separate lots of people and with present-making continuing right up to the wire. I also made the decision to wait until the last guests had gone home before opening my two Stitching Santa parcels, which meant resisting the temptation to have ‘just a little peek’ until the 28th December. The 28th – can you imagine the willpower needed! Anyway, when the time came, I put on a Christmas film for The Boys to ensure no interruptions, poured myself a large glass of Bailey’s and recovered the last two presents from underneath the Christmas tree. At this point in the proceedings, the obligatory festive red dress and sparkly cardigan had been discarded in favour of ‘lounge wear’. But not just any lounge wear, oh no – hubby bought me some Cashmere trousers to go with the waterfall jacket bought previously. So I’m sitting smug, head-to-toe in ridiculously soft Cashmere. And drinking Bailey’s. I had already put one of my presents in the fridge as per Bekki’s instructions, so I opened her parcel first – a Yarny one from The Dartmoor Yarn Company. Beautifully wrapped in snowflake paper and stripy cord, I had already had a quick look when I put the first gift in the fridge a week earlier. This was the first to be opened and turned out to be fudge made by Bekki herself, which was a godsend as the fudge I had made turned out more like toffee. (I re-named it ‘Fudge Brittle’ and I think I got away with it!). In true DYC style, Bekki had chosen a fab card and letter in with the parcel. 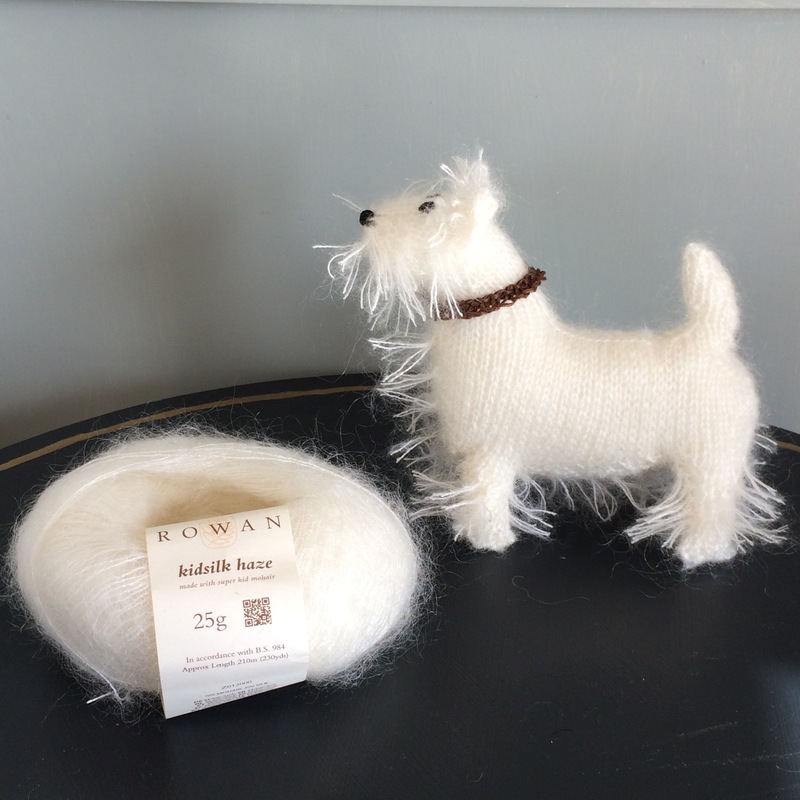 The very next present I unwrapped was my favourite of all – a hand dyed skein of yarn from a company local to me with which I am already familiar; Rosie’s Moments. 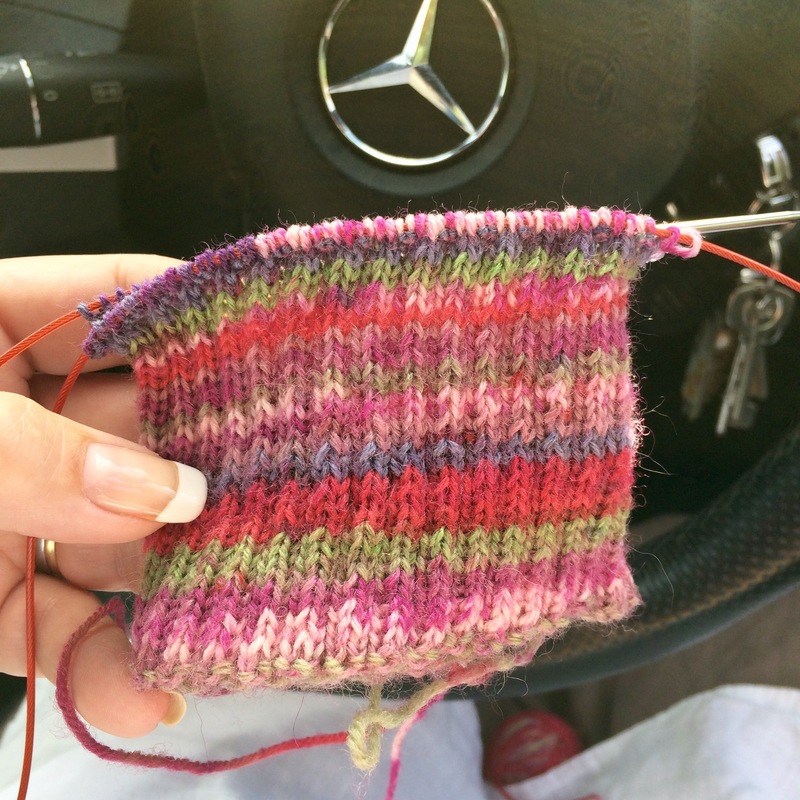 A self-striping yarn in my favourite shade of fuchsia in what I think is a DK weight. 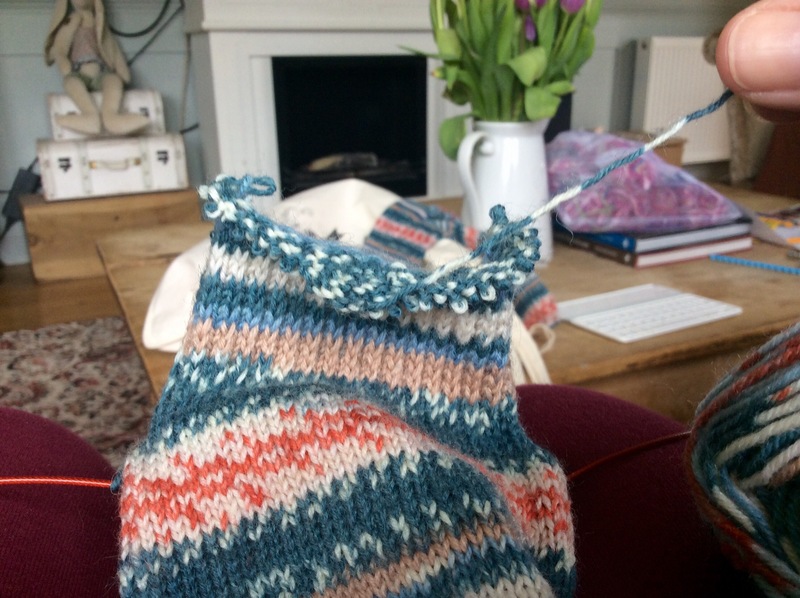 I have already cast on a pair of socks and it is knitting up beautifully! 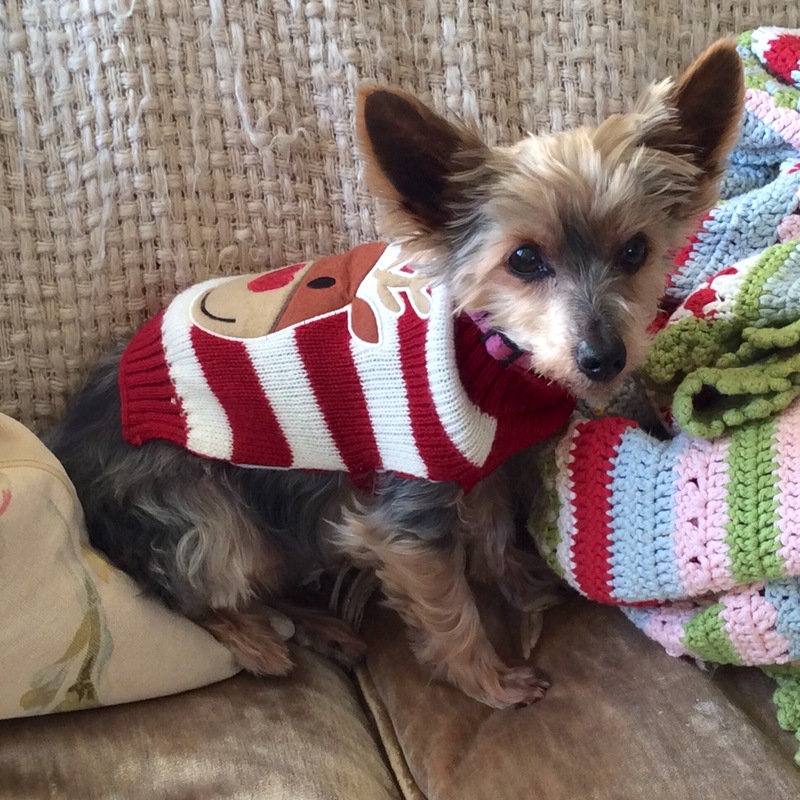 One of Bekki’s famous Christmas puddings was next out of the box – isn’t it sweet? Some wool tops in Christmassy red, green and white will turn into a felted creation or two, when I’ve got my creative head back on. 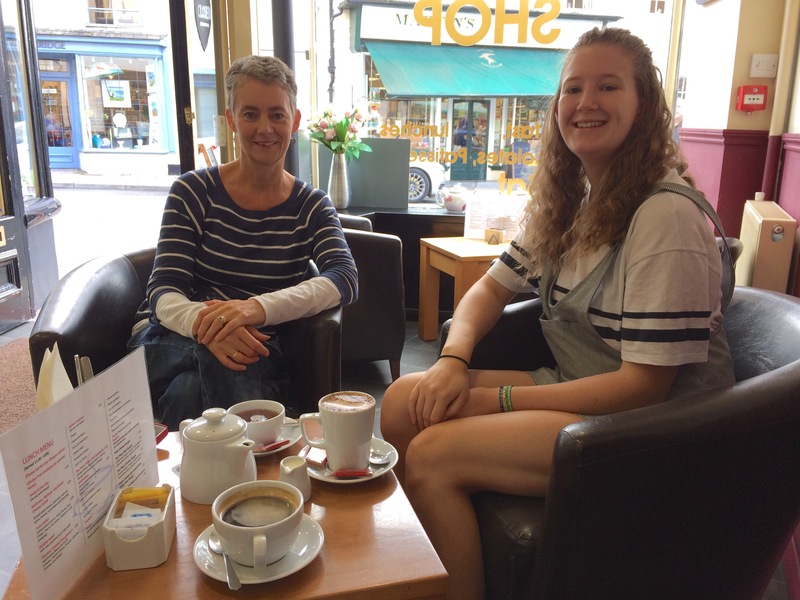 Bekki even included one of her handmade lavender scented candles – one of my favourite scents! That is going straight on my bedside table as it helps induce sleep. Not that I ever have a problem sleeping (I do love my bed; it’s currently 12.35pm! ), but it will smell lovely just before lights out. Yes Bekki, I did guess it was an egg cosy! 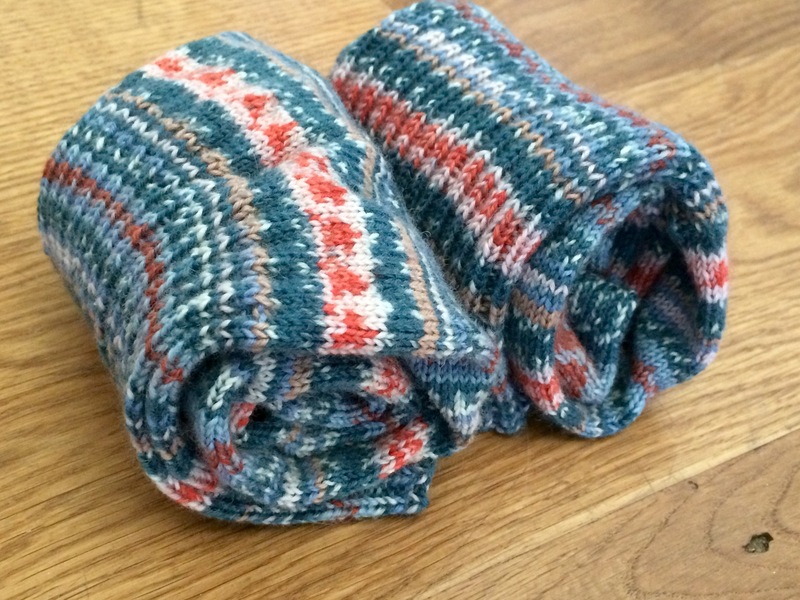 Three gorgeous handknit sacks each contained a tiny handmade gift. Bell-shaped flowers crochet stitch markers…..
…..and the dearest little pearl-drop angel. 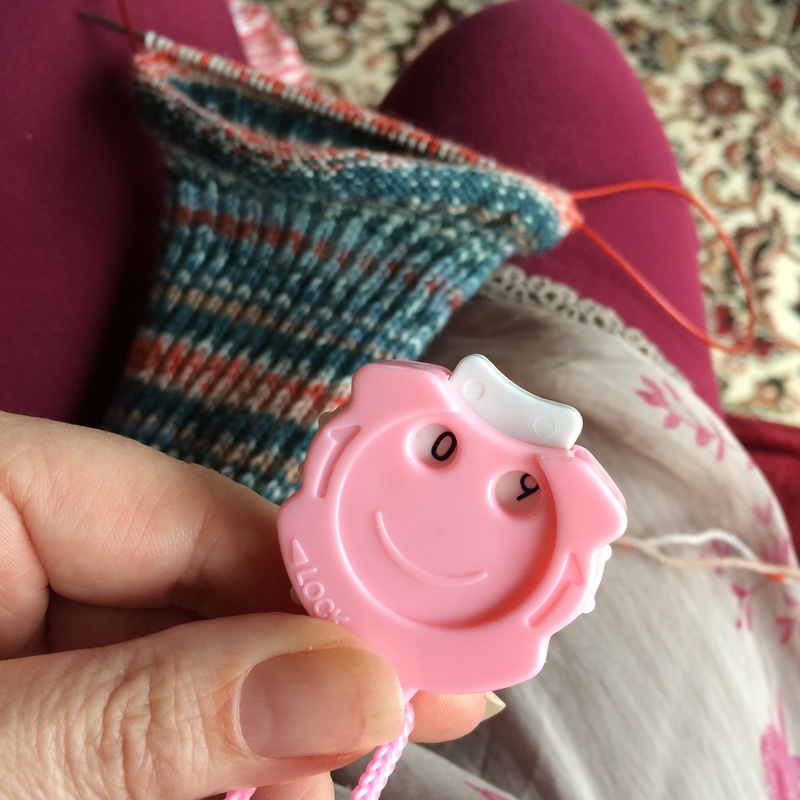 Now I’d unwittingly given my input on the design of this hat, as Bekki had craftily canvassed for opinion on pom poms on her blog, which she dislikes and I love – so the pom poms won out! Despite concerns about exploding pom poms, mine are perfectly intact, as you can see. Even The Dogs had a gift each of identical bandanas. 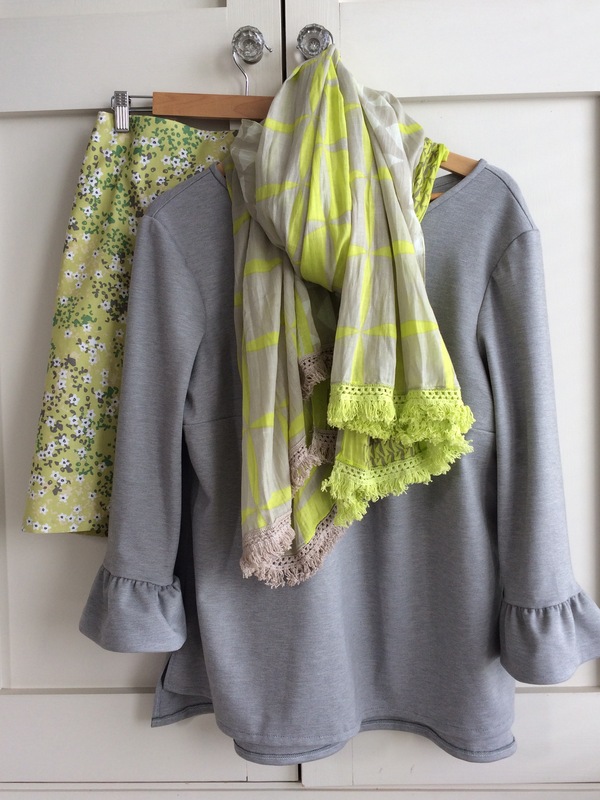 Fifi wears hers holly side out…..
And here it is all together! Thanks SO much Bekki – I love everything and you got me spot-on. The thought that has obviously gone into my parcel is immense and all those handmade extras are a joy which I will treasure. 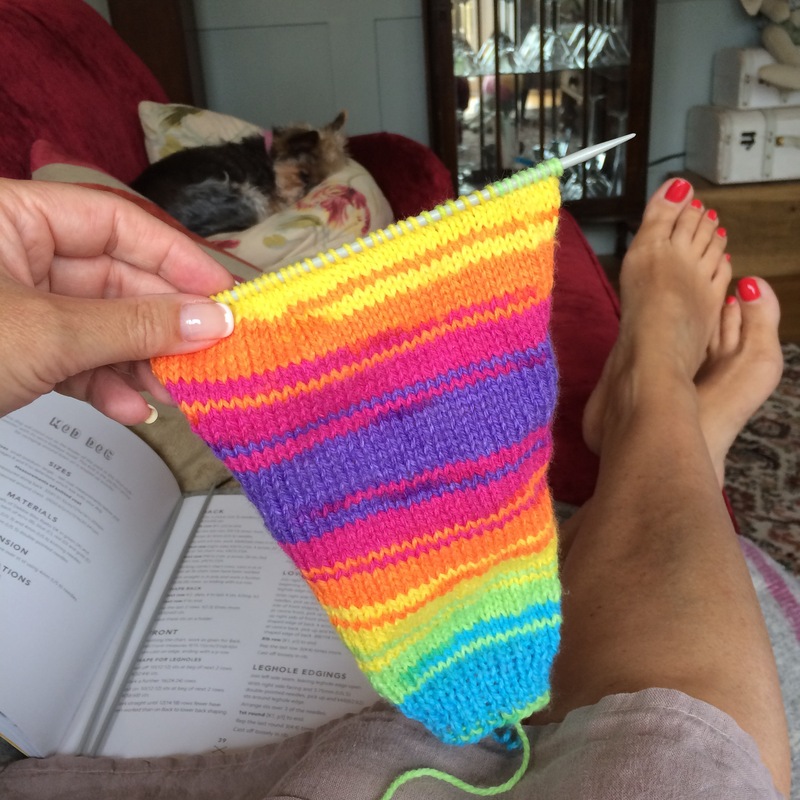 Now to get back to those socks……. 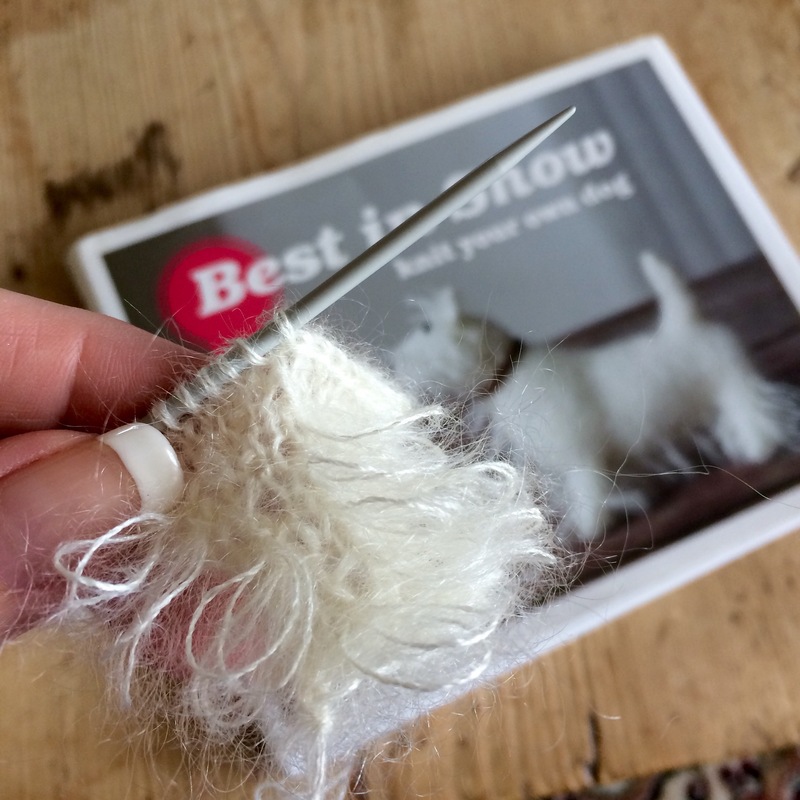 Categories: Knitting | Tags: #stitchingsanta, 2017, blog, Christmas, craft, gift, handmade, knitting, present, santa, secret, stitching, swap | Permalink. Having been invited to a friend’s birthday party at the beginning of December, I found myself in the unusual position of knowing exactly what to make her as a gift. She had previously shown me a book purchase in which there was a typical Tilda doll, and mentioned that she loved them in all their whimsical weirdness. As I happen to own several of Tone Finnanger’s publications, it was an easy decision to actually go ahead and make one for the first time. 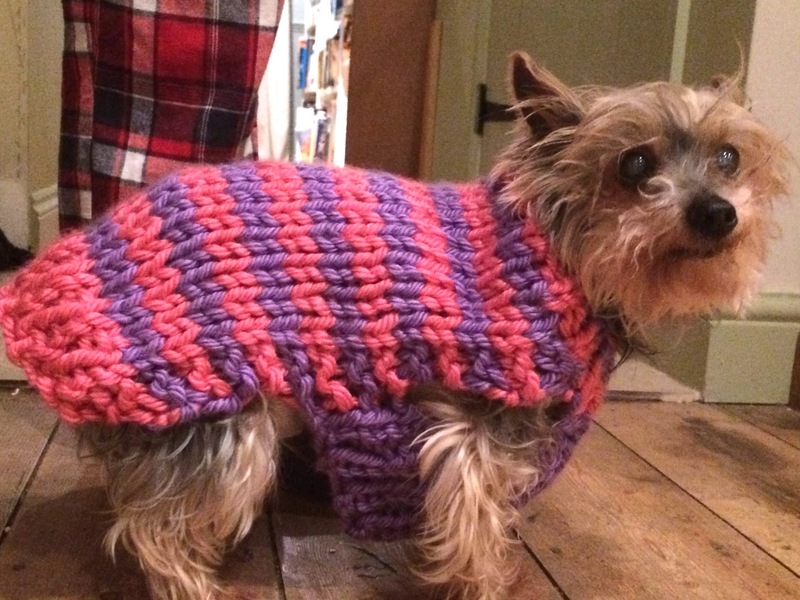 I had some wool left over from knitting the Westie, but had to add in some pink to make two-tone sleeves as there wasn’t quite enough of the cream. 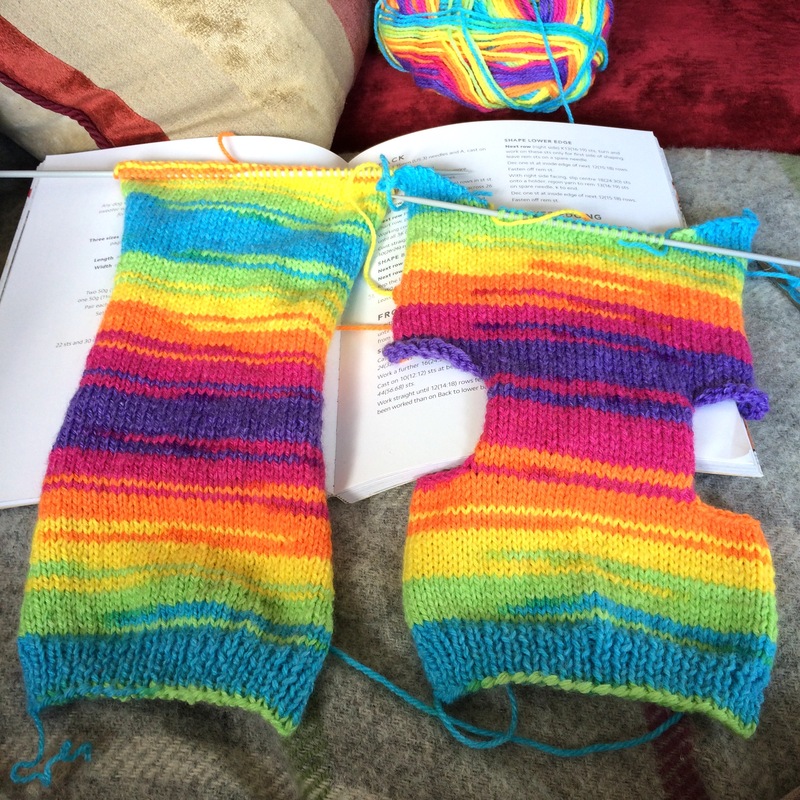 Although just a small project, the jumper and stockings took the best part of a day to knit – but aren’t they cute? Cutting a star shape out of some firm interfacing, sequins were individually sewn on until a sequin star was achieved. The use of pink sequins ties in with the pink sleeves. Now, on to the doll itself. 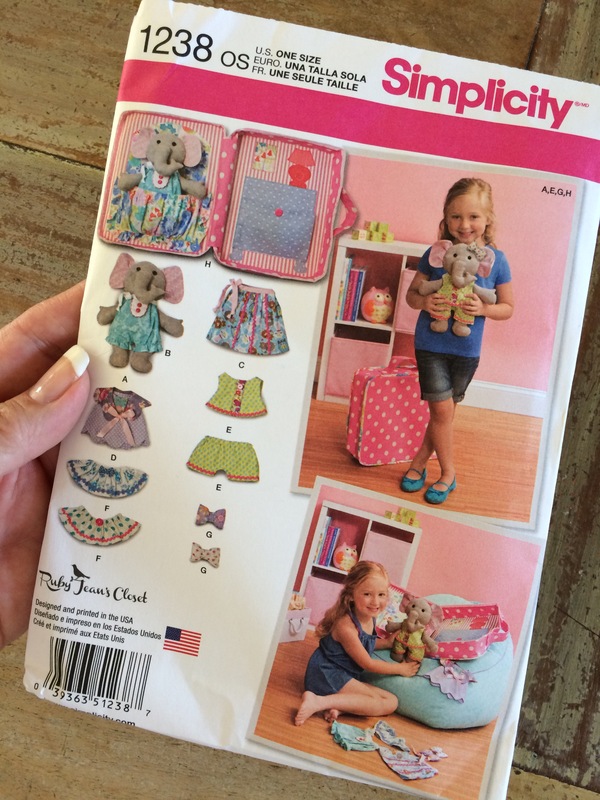 The instructions direct you to draw around the pattern pieces and sew BEFORE cutting them out. This is the best method when dealing with narrow pieces of fabric. 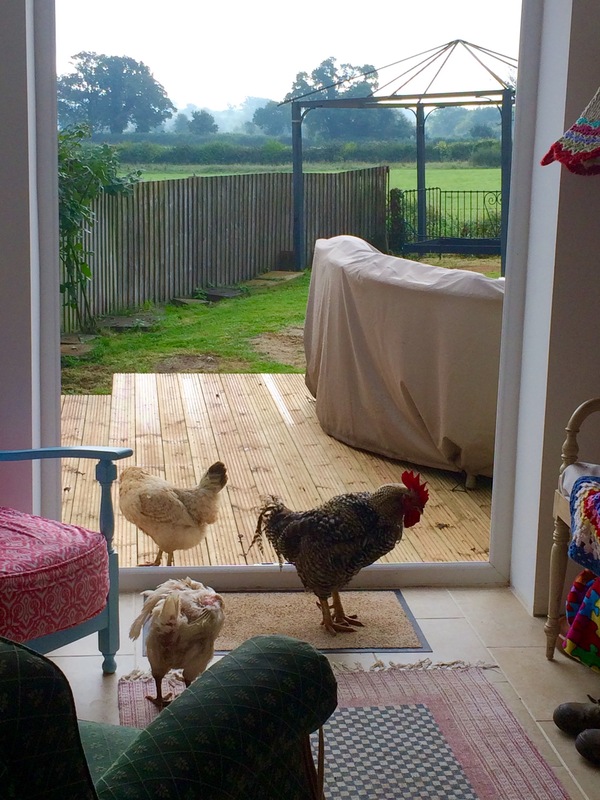 This is what you end up with and then comes the fiddly bit – turning them the right way out!! It took at least an entire hour to turn, stuff and assemble the doll, probably nearer two – then you end up with the weirdest proportioned doll you have ever seen! Following the instructions to the letter, the hair was added. I ran out of cream yarn so, instead of winding tiny balls for the side buns, I wound what was remaining around two miniature pom poms for the same effect. Two dots for eyes were added along with a smudge of blusher, and she’s finished. The trousers were a simple and quick finishing touch. I added a thread chain at the base of her neck so she could be hung from a hook as well. Here she is sat on my table just before being wrapped and gifted an hour later. I know, I know, yet another by-the-skin-of-my-teeth project! My husband thinks it’s ugly and odd, and I kind of see where he’s coming from but, luckily, my friend loves it and that’s all that matters. Categories: Knitting, Sewing | Tags: doll, finnanger, gift, handmade, present, Scandinavian, sewing, Tilda, tone finnager, toy | Permalink. The last three year’s #stitchingsantas were such a roaring success, that I promised to do it all again this year and the time has come to sign up! It’s a Secret Santa with a difference aimed at all the like-minded crafty folk here on the internet – YOU! Whether you’re one of the lucky few whose family know and understand you so well that you receive endless perfect gifts based on your love of sewing/crochet/knitting or, like me, your wish list is met with a “What do you want one of those for….what is it anyway?” – #stitchingsanta is for you. 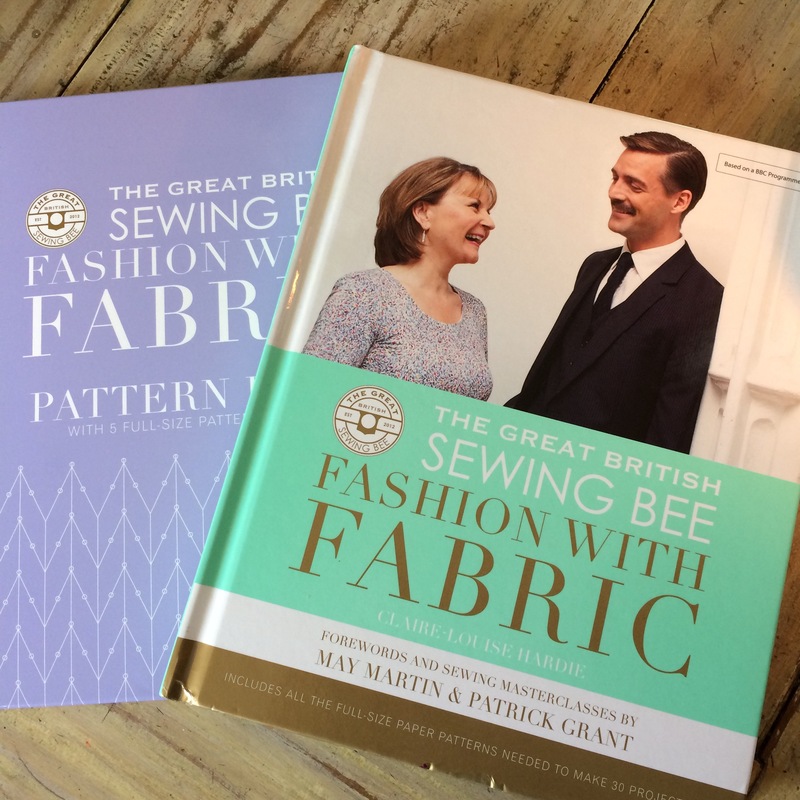 Can you imagine unwrapping a gorgeous skein of wool, a perfect metre of fabric, some vintage buttons or some embroidery silks? Perhaps a little handmade gift has been popped in the parcel too? All lovingly thought out with your interests in mind and guaranteed to be under your tree on Christmas morning. What a treat! There are TWO categories to choose from – you can enter both or just one but PLEASE state your preference in your email. 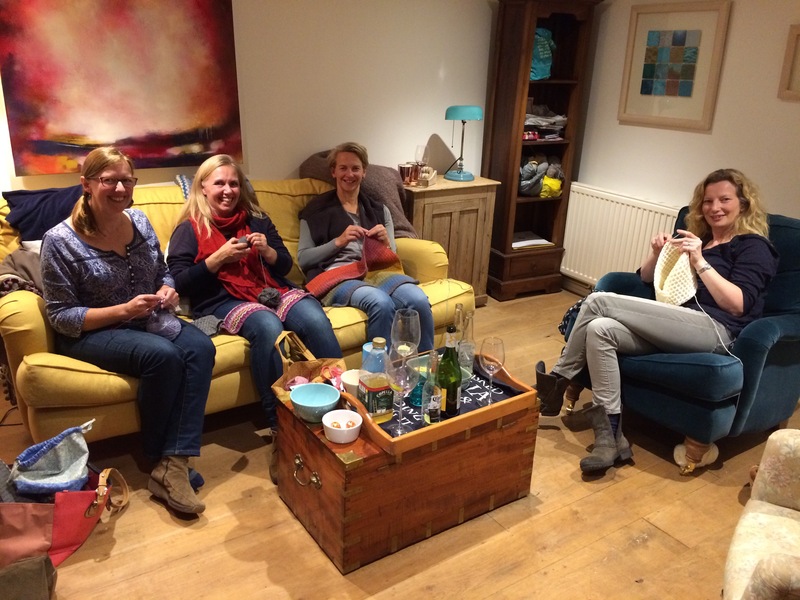 Choose from “Sewing” or “Crochet/Knitting”. The idea is simple: if you would like to take part, comment below by the deadline of 31st October and I’ll send you the details of your lucky recipient. I will update this page with details of the blogs that are taking part so why not follow along and make some new blogging buddies! You can enter from anywhere in the world but I will try to match countries in order to keep postage costs down. 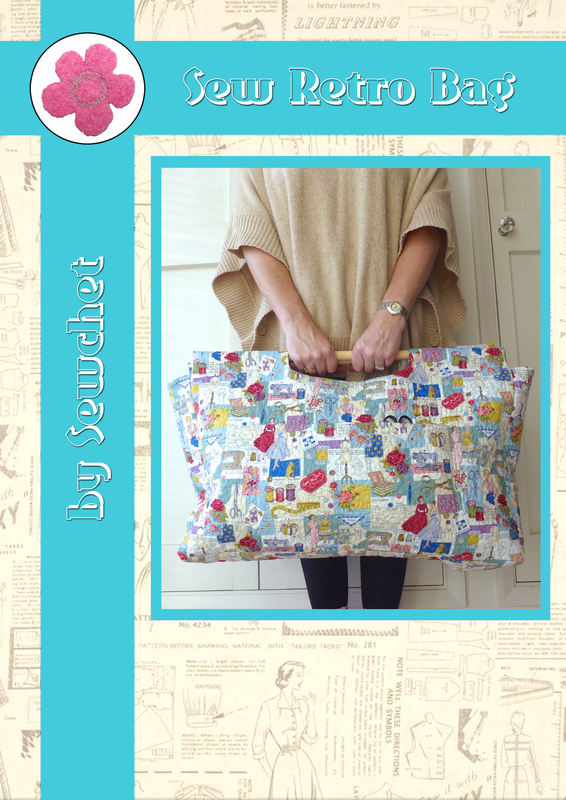 State which swap(s) you would like to enter and send your email address, blog site and postal address to me at info@sewchet.com by midnight on 31st October 2017. I’ll email you the details of your recipient by 7th November. Spend a maximum of £10 (€13, $15US, $20AUS) excluding postage. 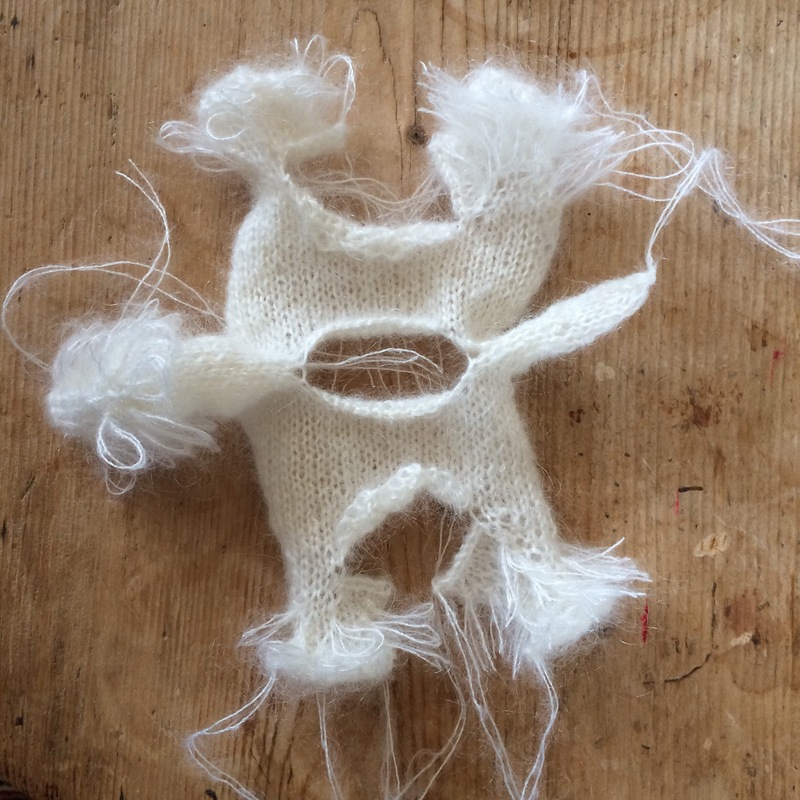 Blog about your #stitchingsanta (linking back to this post) and share using the hash tag on social media. Post your parcel in time for Christmas – check last posting dates well in advance!! International dates are much earlier in December. I hope lots of you join in – don’t forget to share, share, SHARE with your own followers, the more the merrier, HOW exciting! 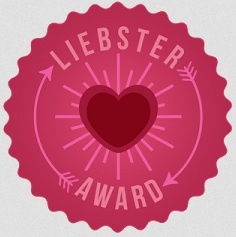 Grab A Button For Your Site! Categories: Crafts, Crochet, Knitting, Sewing | Tags: #secretsanta, #sewingsanta, #stitchingsanta, Christmas, swap | Permalink. 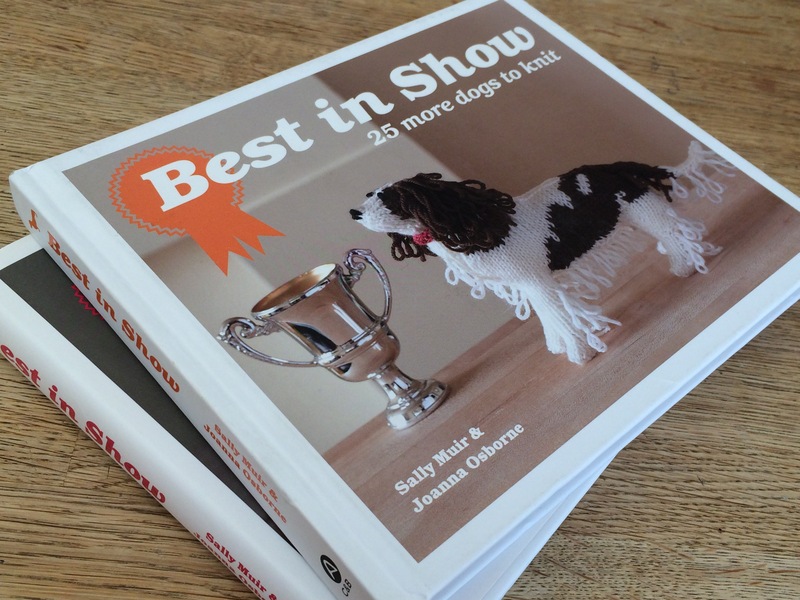 When I posted this photo on Instagram, of the “Best In Show” book of knitted dogs that I bought nearly-new for a bargain on Amazon, it had a mixed reception. Some people thought I’d lost my marbles while others clearly saw the attraction of knitting such pointless-but-cute objects. So, when the other one in the series one popped up at a knock-down price, obviously I snapped it up! 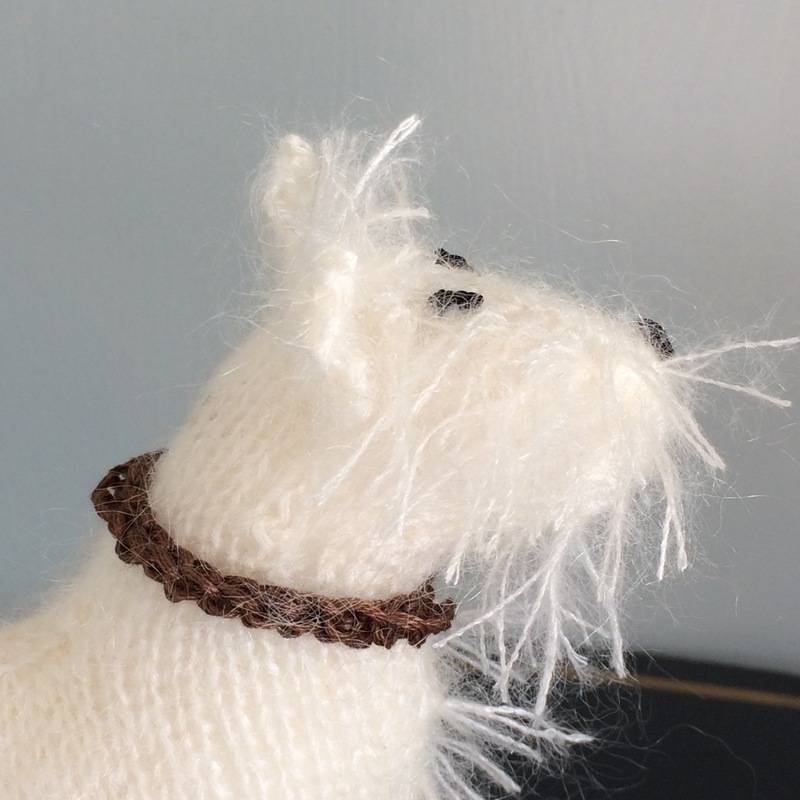 Almost instantly, a lovely Instagrammer from Australia contacted me and asked if I’d consider a commission for her of a West Highland Terrier, a “Westie”. Of course, I jumped at the chance to have a bonafide excuse to actually go ahead and make one, so agreed straight away. 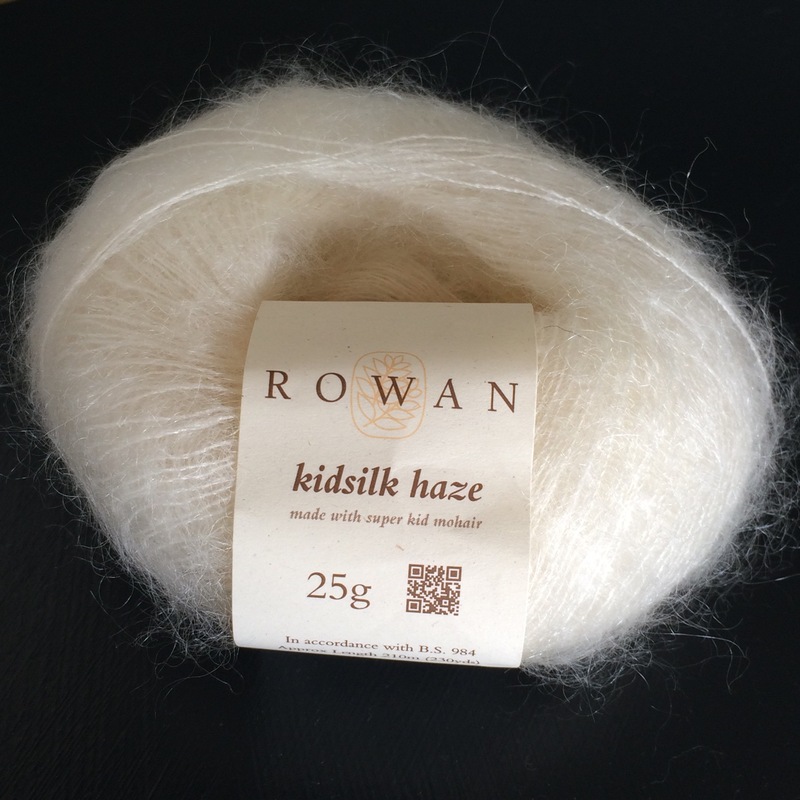 Unfortunately, there is no local stockist of Rowland Kidsilk Haze, so I had the ideal opportunity to put together a larger order with an online stockist to include yarn for a poncho that I’d admired for a long time. Armed with everything I needed, I couldn’t wait to cast on. 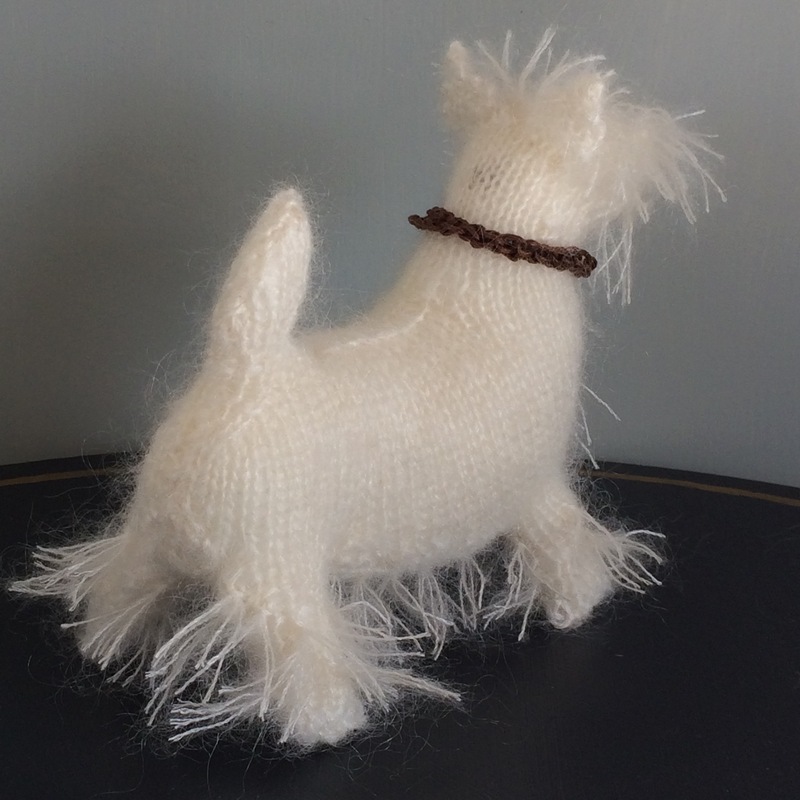 The fuzzy nature of the mohair would be perfect to imitate the fur of a Westie. 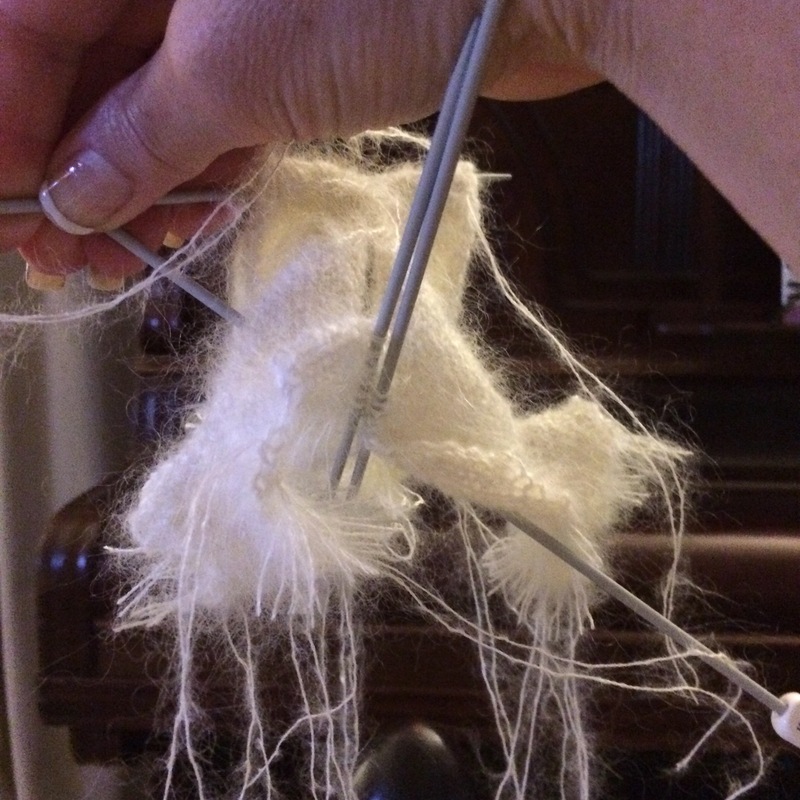 Two strands of yarn are held together throughout. Believe it or not, this is a finished leg!! 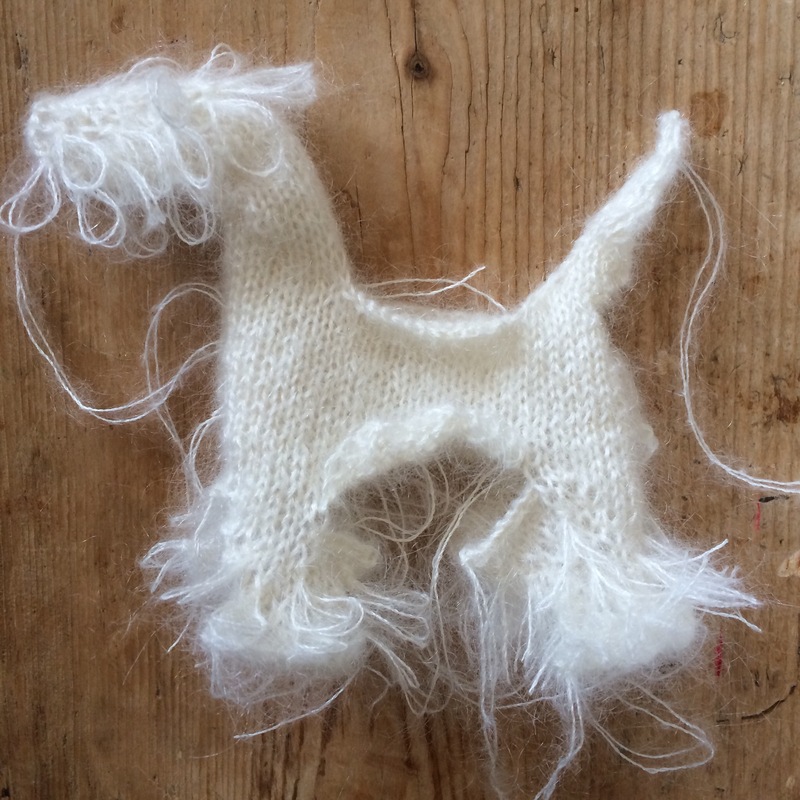 Whilst not complicated, you need to concentrate on the instructions especially as this one asks you to “follow instructions as for Scottish Terrier” for certain elements of the knit. 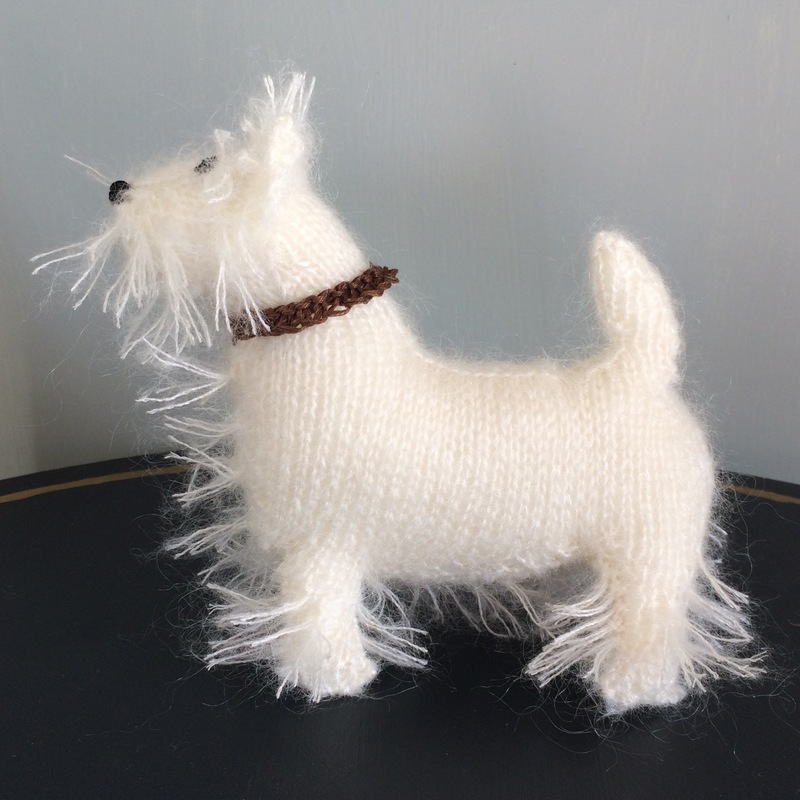 At this point, the knitting was almost completely finished but still looked absolutely nothing like a dog, let alone a Westie! 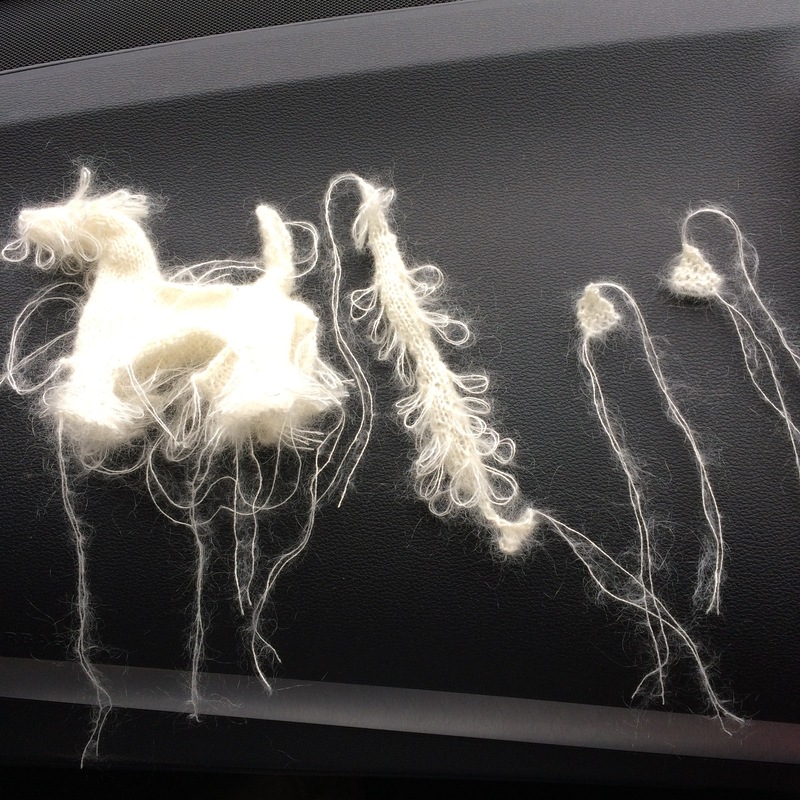 The extra bits were finished in the car whilst at a football match – they’re laid out on the dashboard. Now to sew it all together. 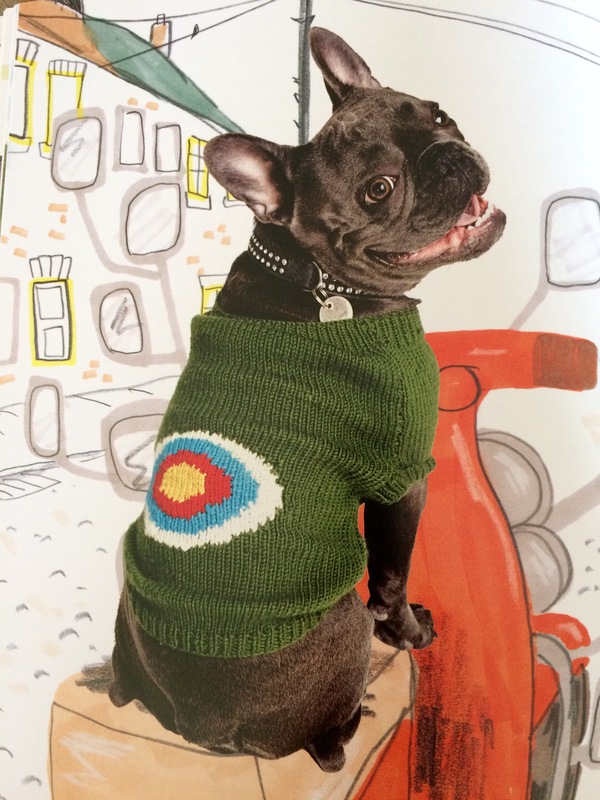 A satin stitched nose, French knot eyes and collar, all made using embroidery silks, are the final touches. For scale, here he is sat in the palm of my hand. He is about 6 inches long and 4 inches high. 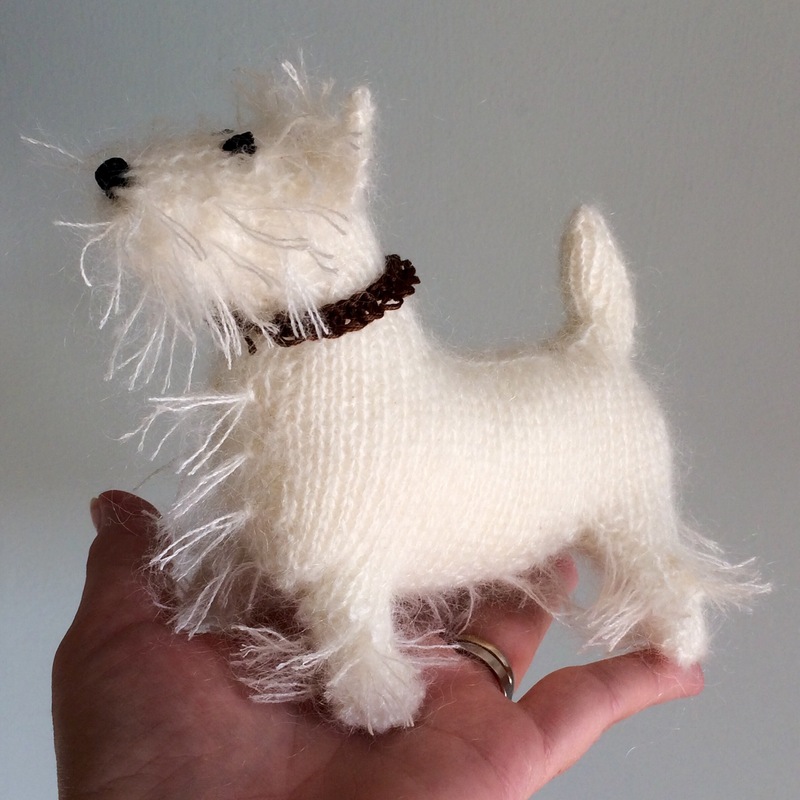 Not only that, but I have enough yarn left to make another one……anyone else want to commission a Westie?!! 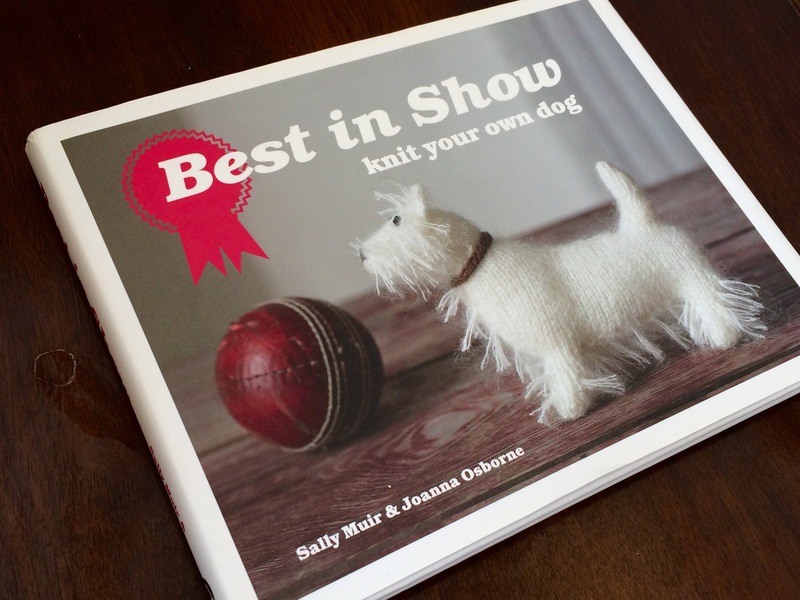 Categories: Knitting | Tags: best in show, crafts, dog, handmade, knitted, knitting, West Highland Terrier, Westie | Permalink. 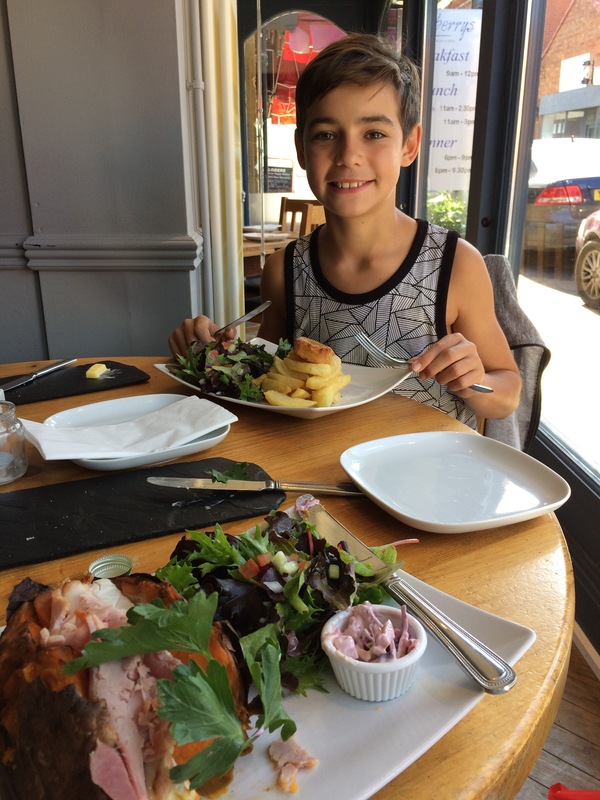 Two week’s worth of Sunday Sevens this week…. 1. My sister and niece came for a couple of days. Always something to look forward to and we just chatter non-stop the entire time. And go out for coffee, obviously. 2. 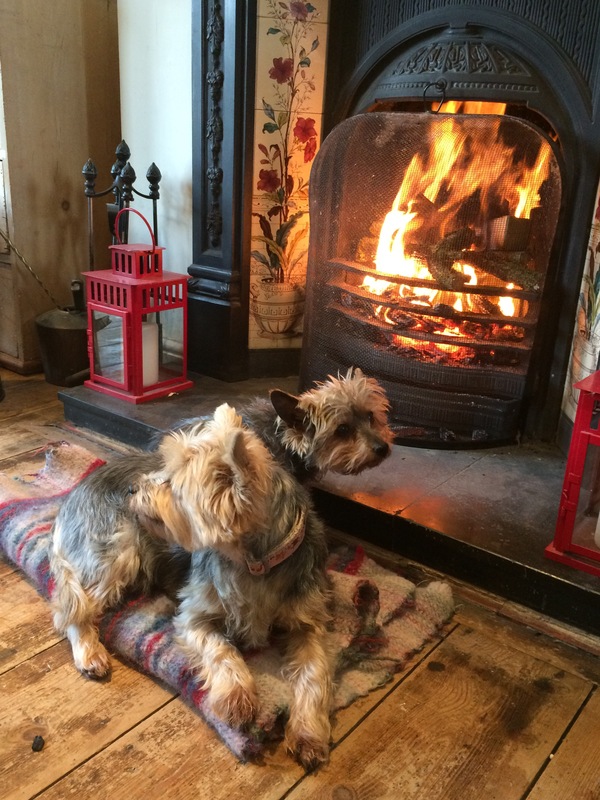 We have actually had a few open fires already and The Dogs are first there to hog the best spot and soak up all that heat. 3. Other days it’s still been mild enough to throw open the French windows and let the fresh air in. 5. 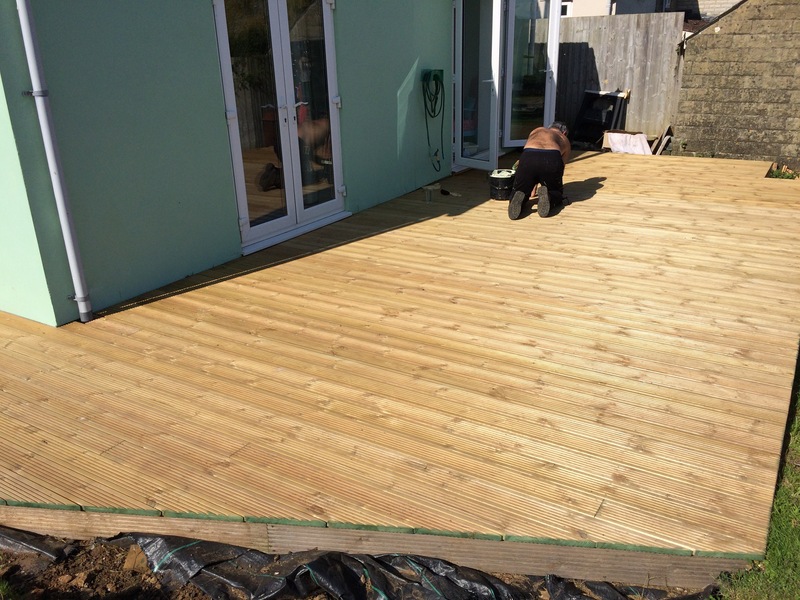 Mr H-L obsessed over the weather forecasts and finally found two four-hour windows in which he could oil the decking. 6. 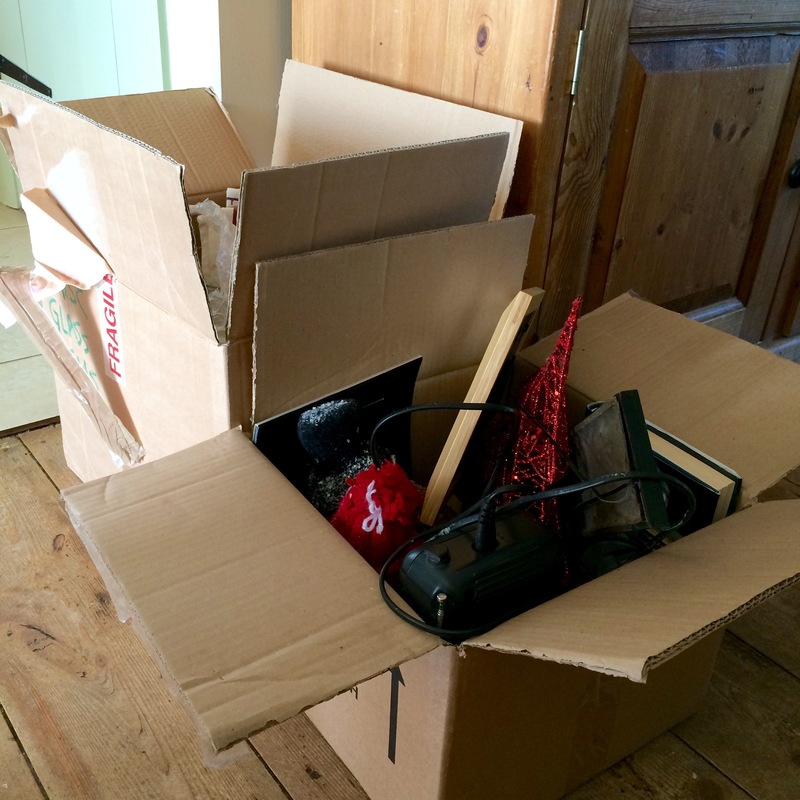 We cleared out the last of the storage unit and completed the difficult task of sorting through Mr H-L’s late parents’ possessions. A tough job but it had to be done. 7. It’s been quite a productive week, creatively speaking. The Cow-Print dress I made had it’s first outing that very evening as we went to see “Dunkirk” at the cinema. We did something we NEVER do – had pizza! 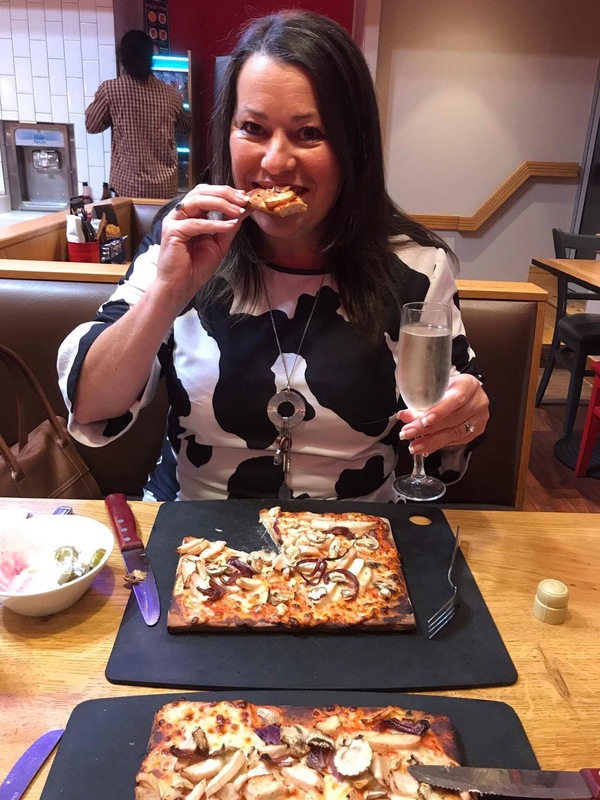 Having eventually committed to going gluten-free a month or so ago, I really fancied a pizza and, luckily, a place right next to the cinema offered a gluten-free option. With prosecco, of course. 8. This will be another Christmas present. I’m ticking off the list slowly but surely. 9. 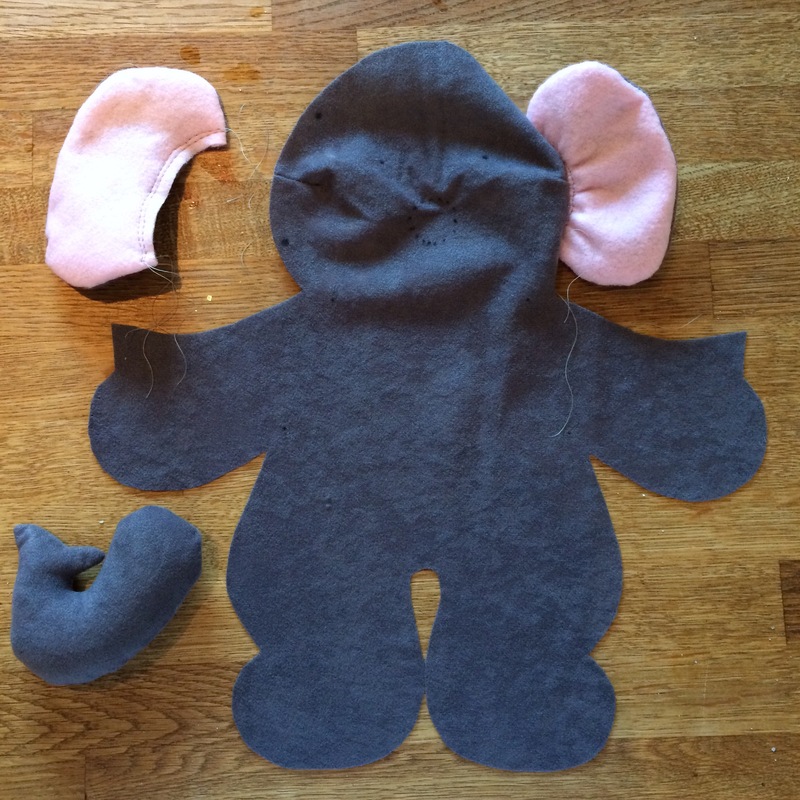 It’s beginning to look like an elephant. 10. 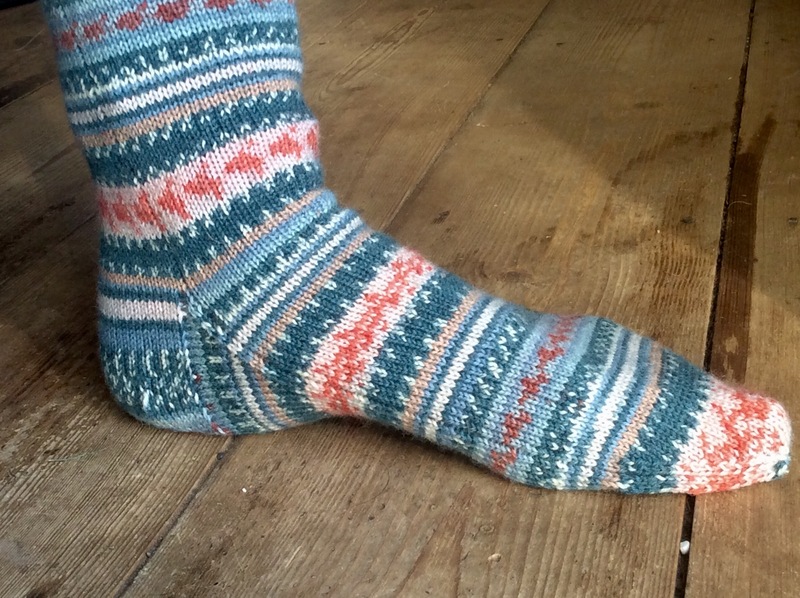 Christmas sock number six is under way after a break of a few weeks. Well, I needed something portable to take to a football match. 11. 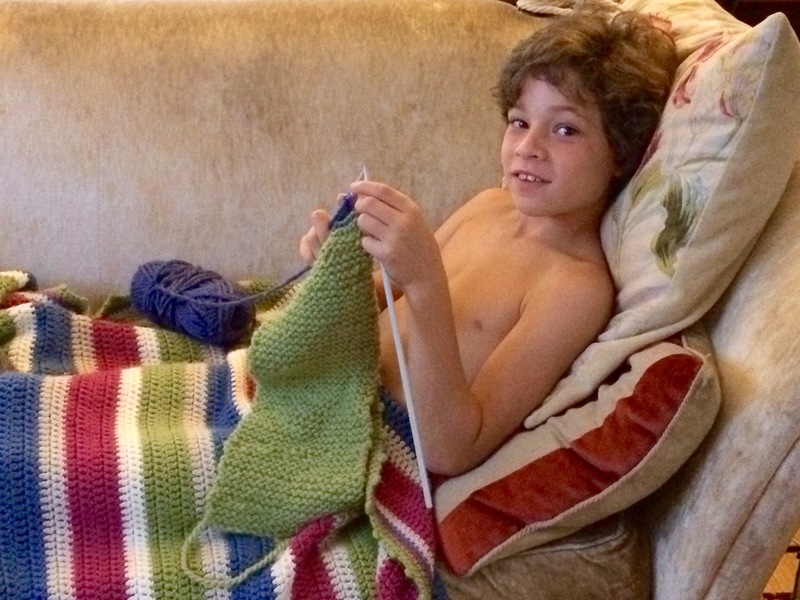 No.3 Son picked up his knitting again. 12. 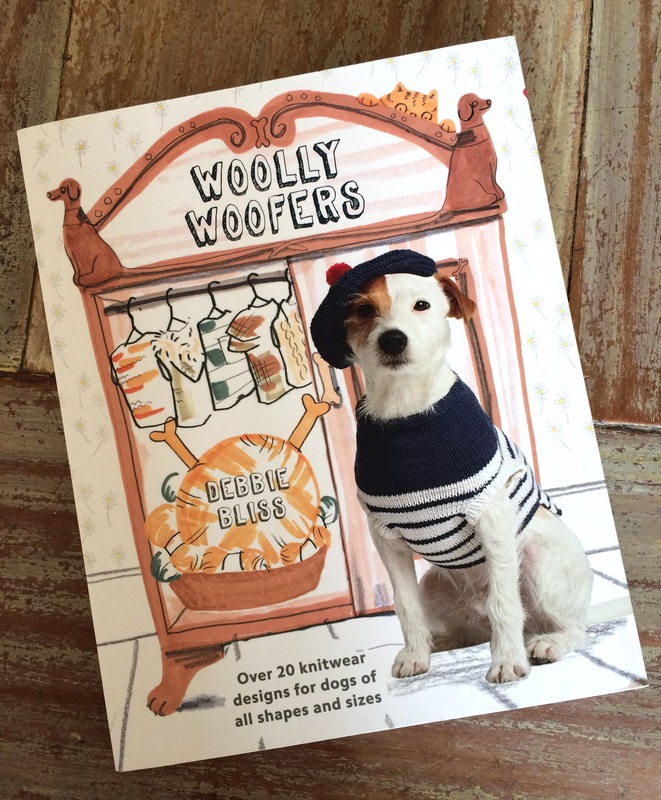 Talking of knitting, I picked up these two books at a bargain price and, having put it on Instagram, have already been asked to do a commission of a West Highland Terrier. 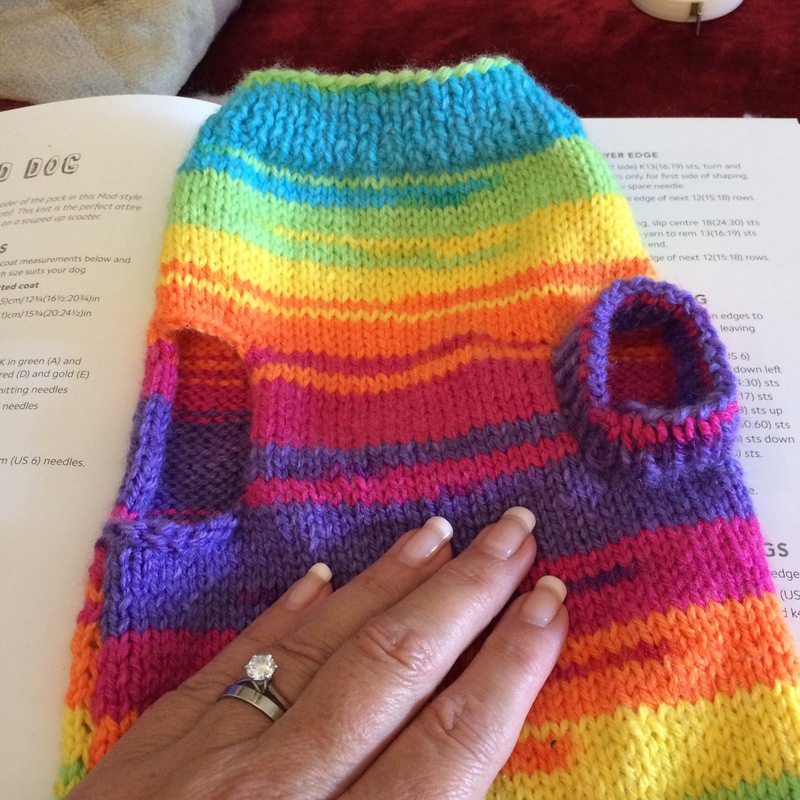 Fab – an excuse to make one! 13. 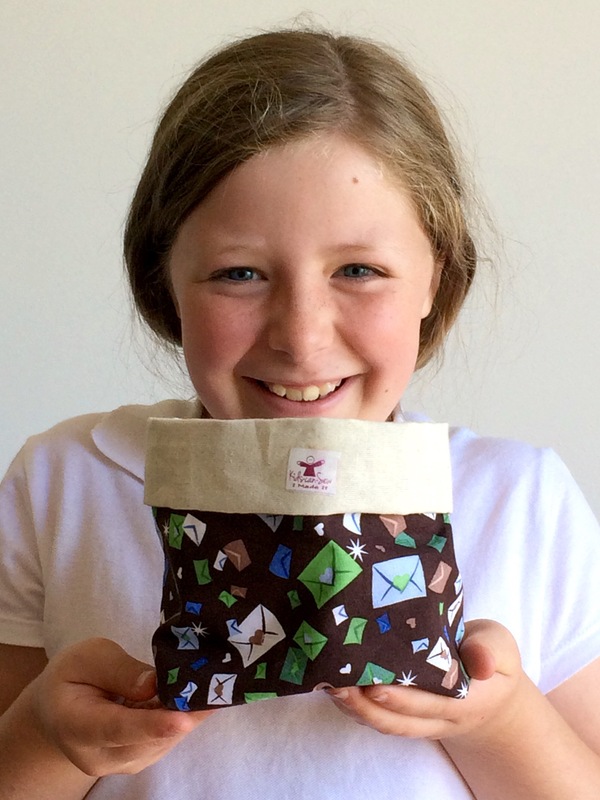 One of my students proudly showing her newly finished fabric storage pot. 14. 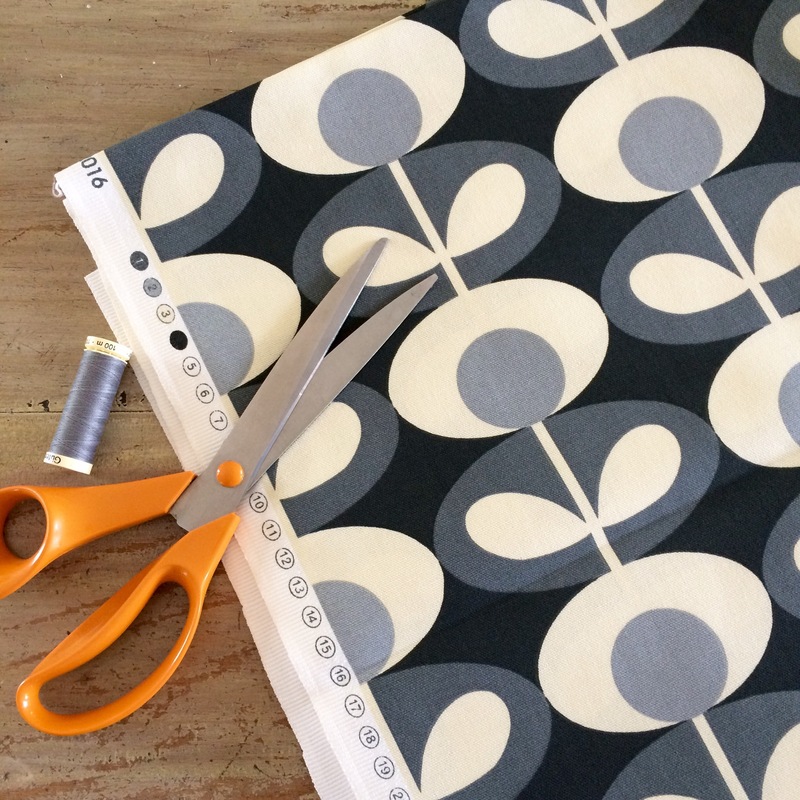 Although I forgot to photograph the finished article, a friend asked me to make her a roman blind from this Orla Kiely fabric. 15. 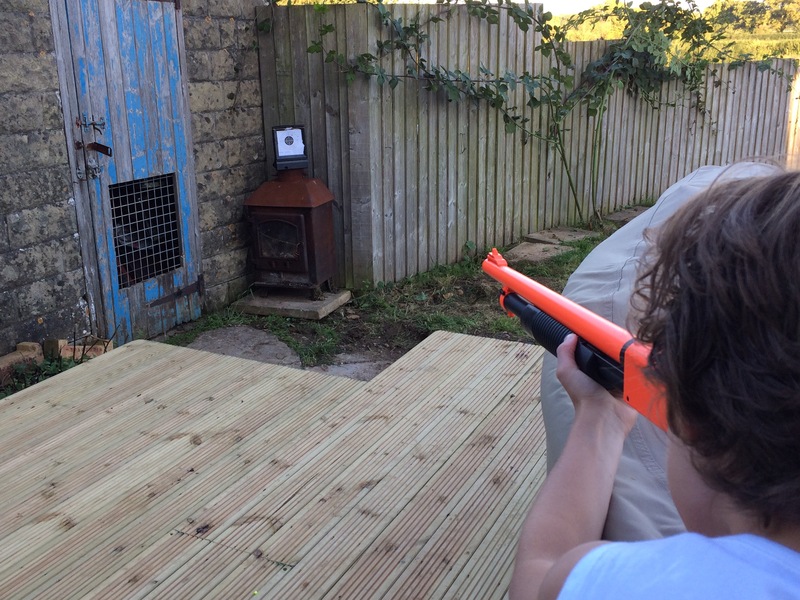 No.2 Son came home for his first Exeat weekend and he and I spent some time together whilst his brother was at football. 16. It is the GBSBlive in London this weekend. I couldn’t be there in person so decided to get in the spirit of things by making a skirt from the book instead. 17. I whipped up a second “Laurel” too, both inspired by a scarf I had in the wardrobe. See, I told you I’d been productive! 18. Not only that, but I managed to squeeze in craft night at a friend’s on Thursday. Look at all these lovely ladies! 19. 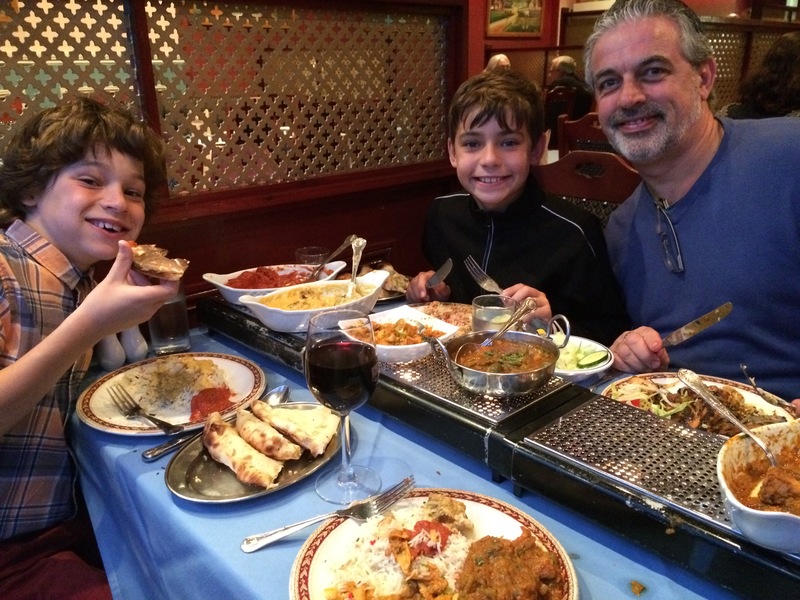 We took The Boys out for an Indian on Saturday night. I must admit, we did miss not being able to have poppadoms or naan bread, especially as The Boys were obviously enjoying theirs so much. 20. 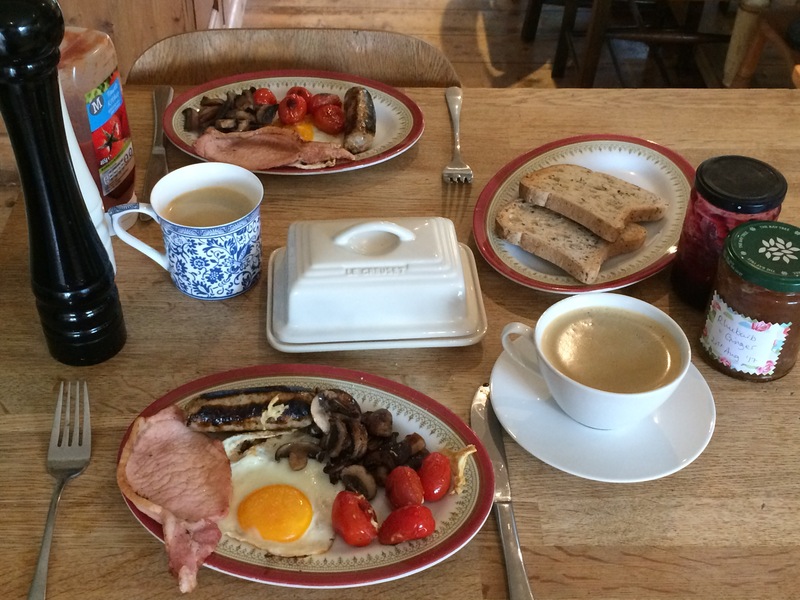 Still, gluten-free isn’t always a hardship – does this look like we’re missing out?! 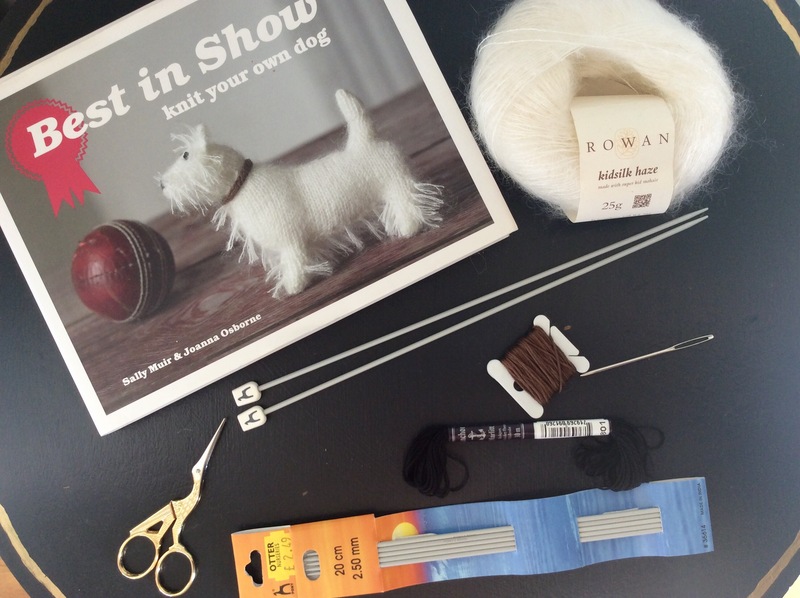 Categories: Knitting, Sewing, Sunday Sevens | Tags: Sundaysevens | Permalink. 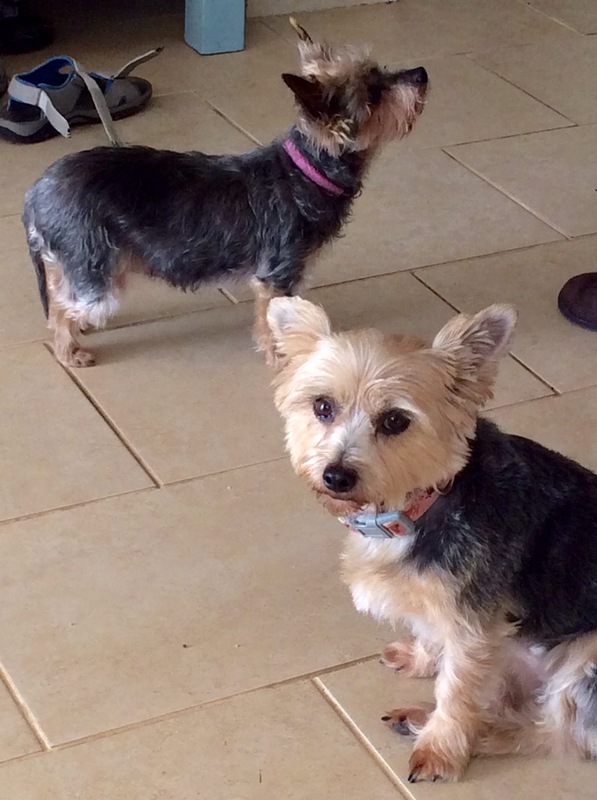 Regular readers of the blog will recognise Fifi and Tess, a 14 year old Yorkie and 3 year old Chorkie, respectively. Here they are in their Winter coats, all long, shaggy and warm. 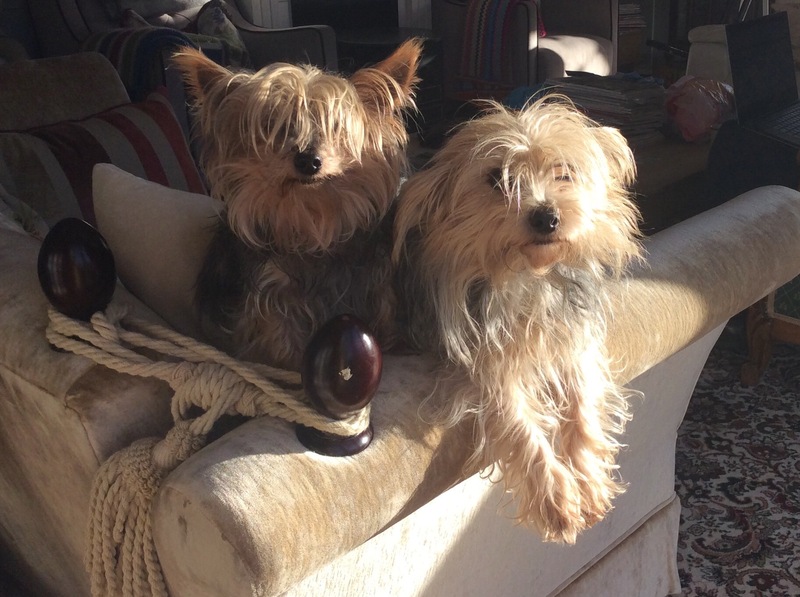 Whilst we were in Spain, my mother looked after both dogs and took them for their annual haircut, and they now look just a tad different! 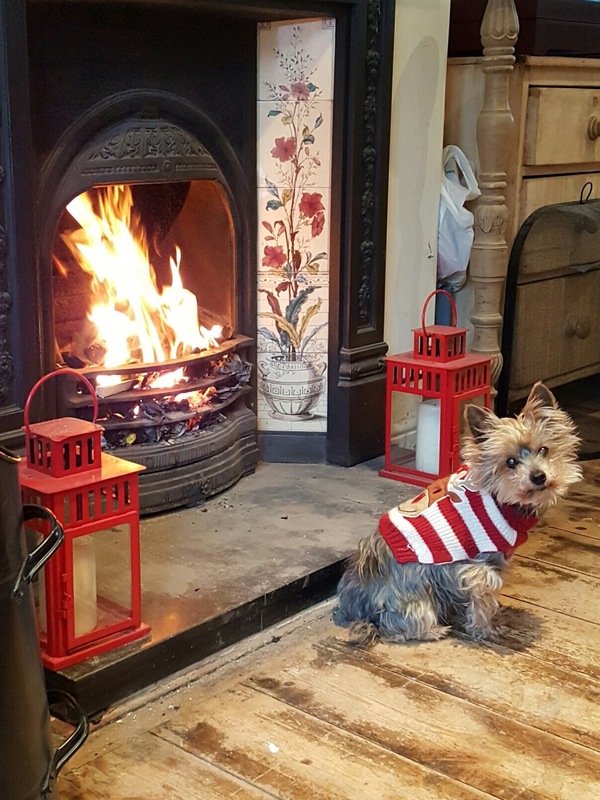 Trouble is, Fifi feels the cold and can always be found sat as close to the fire as possible whenever it is lit. She has a variety of coats; here is her Winter one. 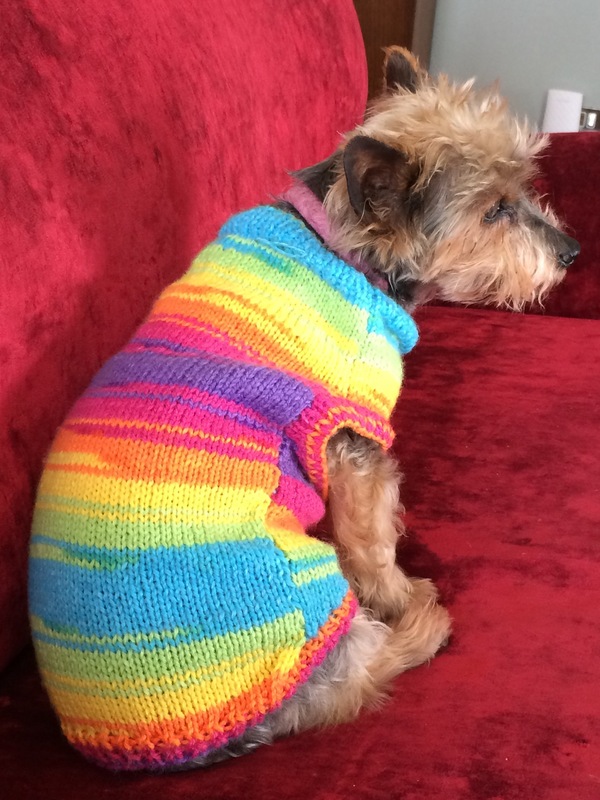 This one was a non-stretch fleecy number, made specifically to stop her licking her wound after an operation. And who can forget this disastrous effort made in rather too much of a rush and was miles too big? Point is that, no sooner had they had their Summer trim, the weather turned – 14 degrees and rain. For two weeks. 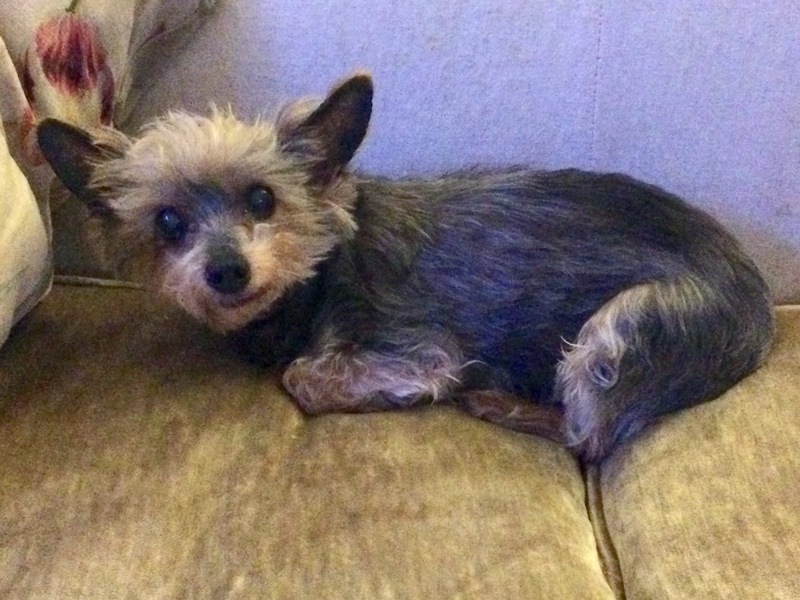 Poor little Fifi spent most of her time curled up in a ball in an effort to keep warm, shivering pitifully. 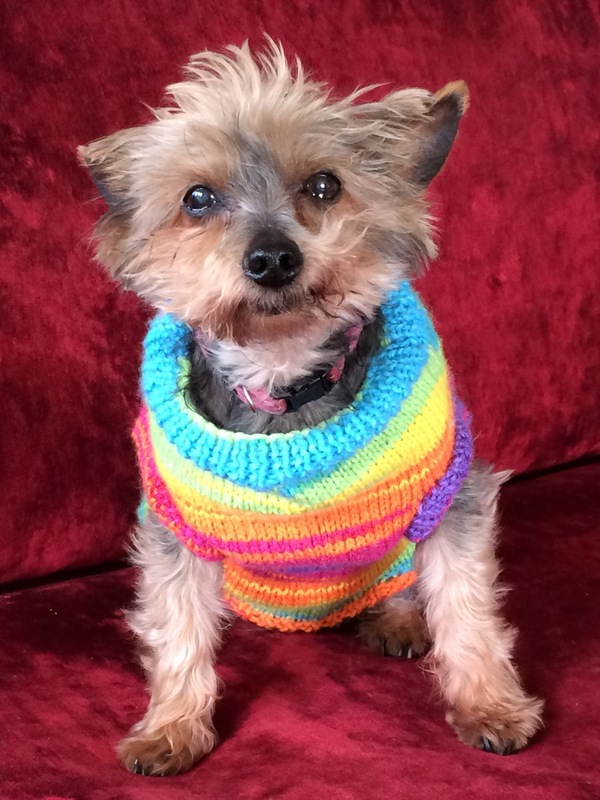 Of course, technically, her Rudolph coat would do the job perfectly well but, quite frankly the excuse to knit up another cute little number from Debbie Bliss’ “Woolly Woofers” in summery colours was too good an opportunity to miss. After scrutinising the descriptions and measurements of various patterns, I settled on a ‘tube’ style coat, which would be close fitting and comfortable. It’s called “Mod Dog” for obvious reasons, but it was the tube style that I wanted, not the Mod design. 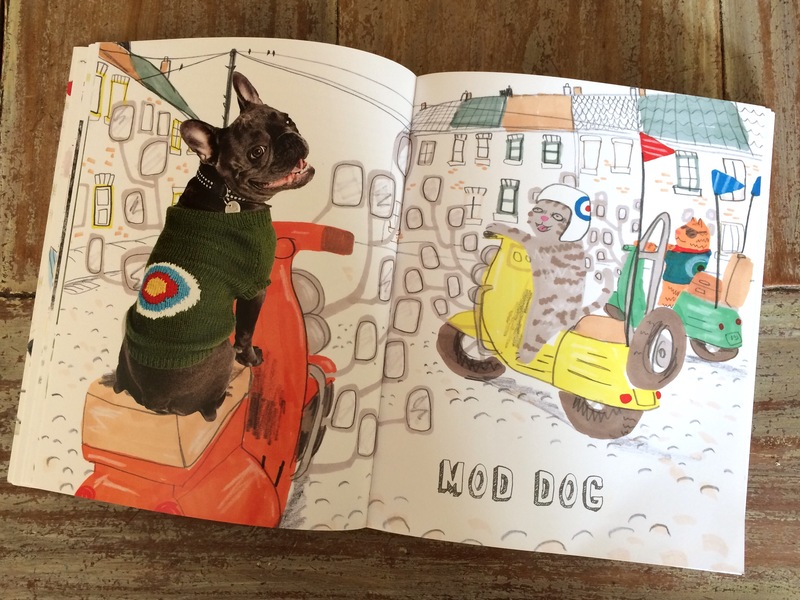 Don’t you just love the illustrations? 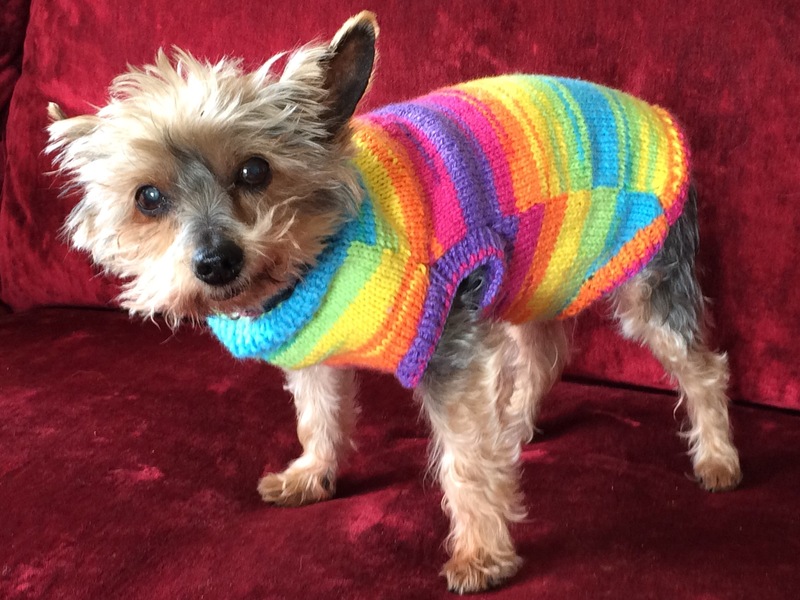 I had the best part of a ball of “Rainbow” double knitting yarn left over from some project or other which would be plenty for this little coat. Wool Warehouse stock it in a dozen different colours. I started straight away. Well, it was howling a gale and pouring down outside, so why not? By the next day, I had finished both the front and back pieces. 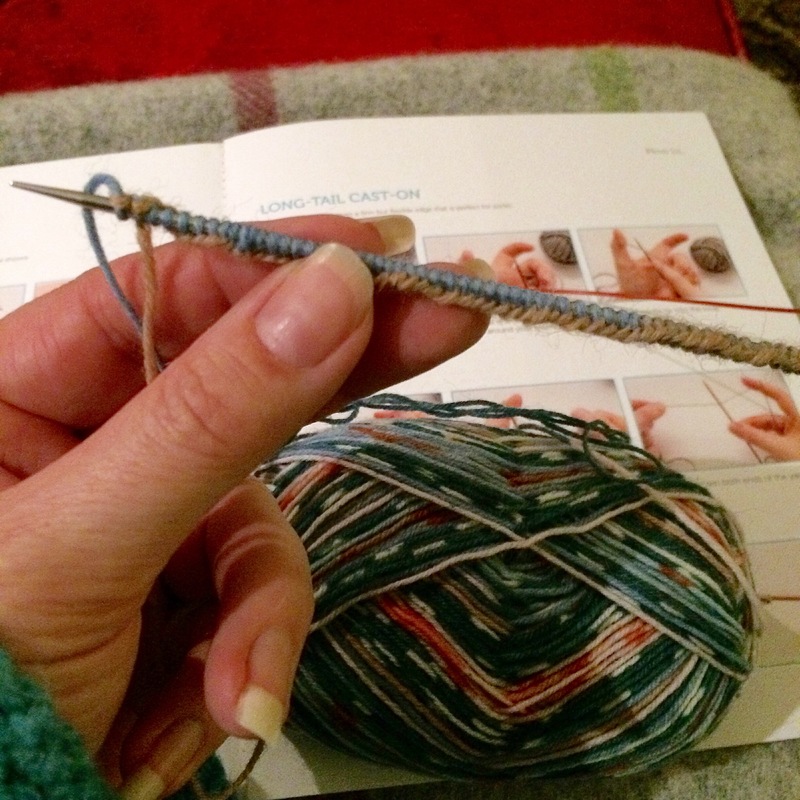 A quick trip to the garden centre later, and I had a set of 3.75mm circular needles to finish the cuffs. How’s that for a season-appropriate colourway? I put the coat on Fifi as soon as it was off the needles and she wore it all night without the need to be wrapped up in a blanket. 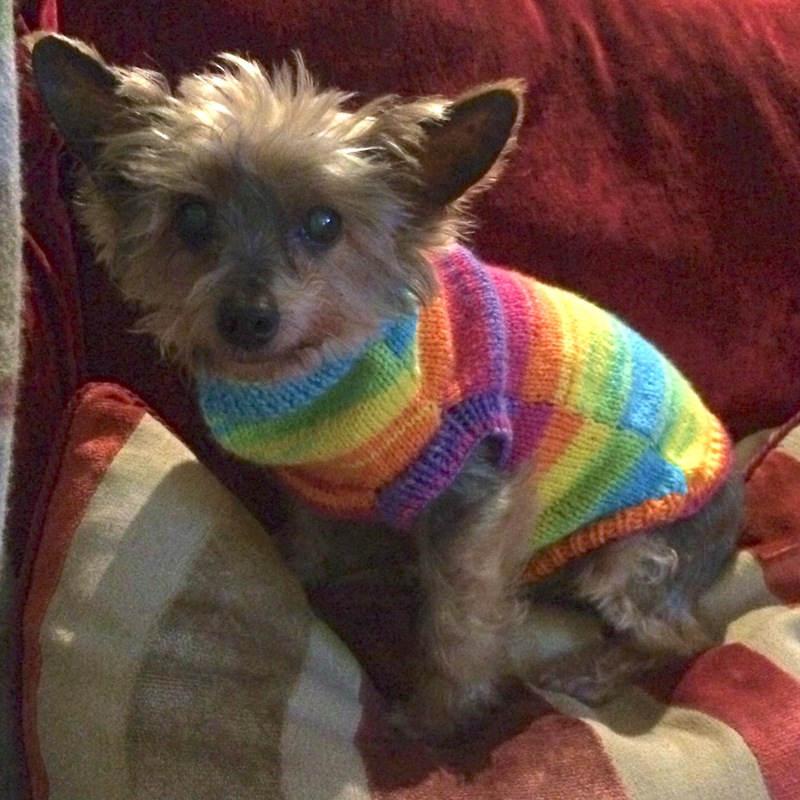 (For “blanket” read “one of Mr H-L’s jumpers”, because he’s so soft). This morning I took some more pictures in daylight to show you. Now she won’t look daft if we go out for a walk, whereas the Christmassy coat might draw a few questioning glances down the pub. Isn’t it sweet? 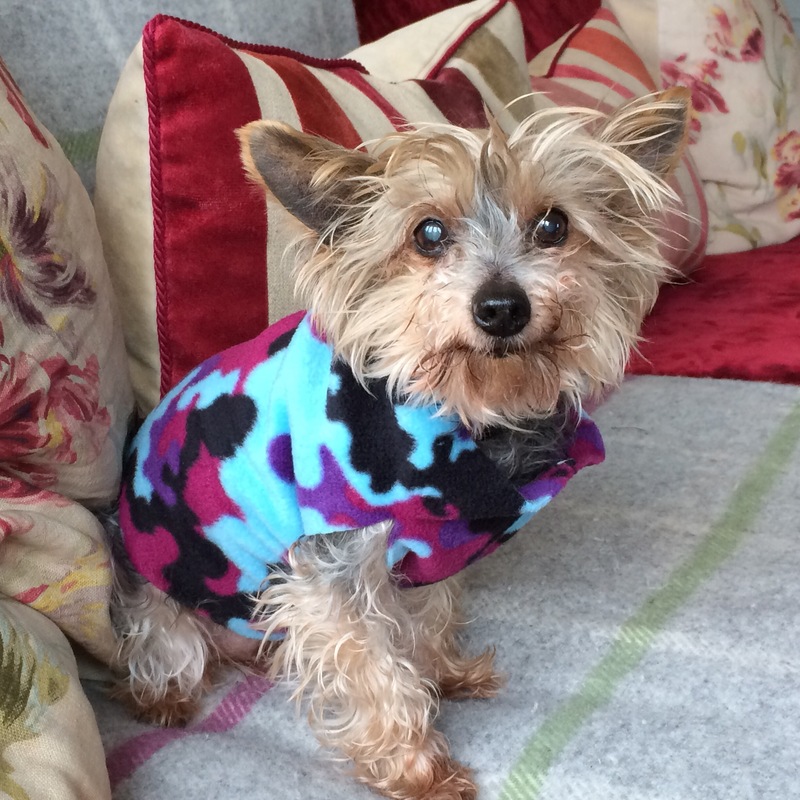 Although I’m hoping Summer will show it’s face at some point in August, at least Fifi won’t be shivering if it doesn’t. 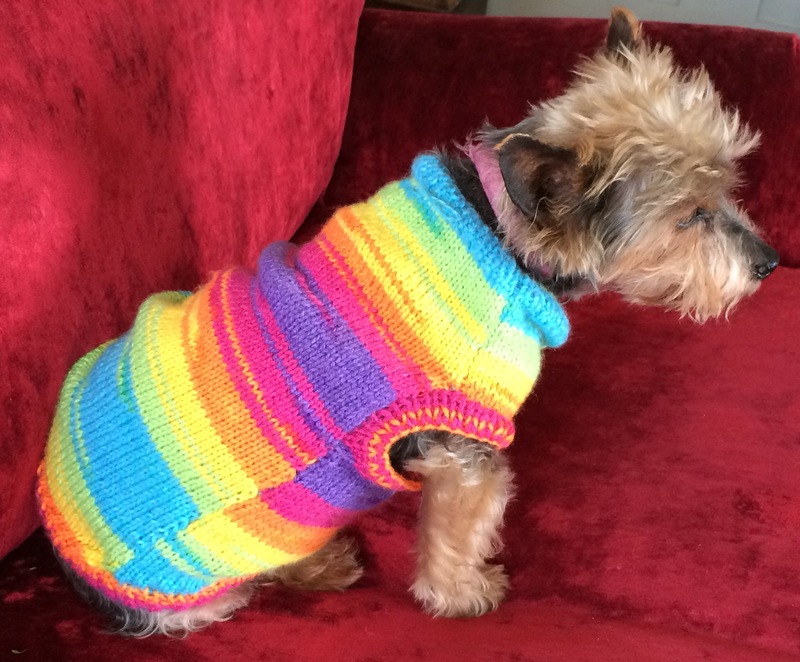 Perhaps I could make a matching coat for Tess….? 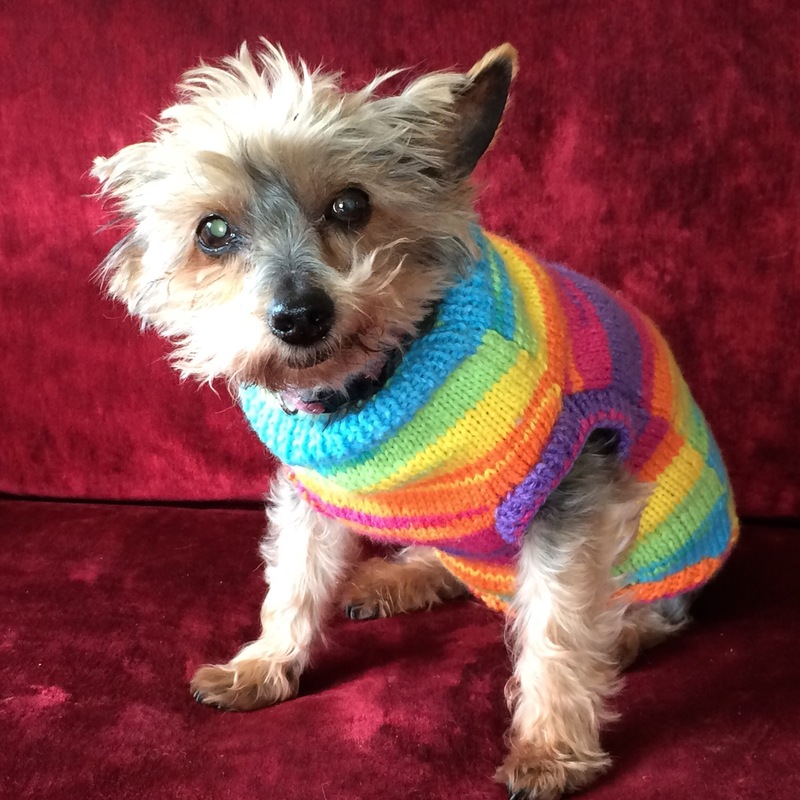 Categories: Knitting | Tags: coat, dog, handknit, handmade, knitted, knitting, woolly woofers | Permalink. 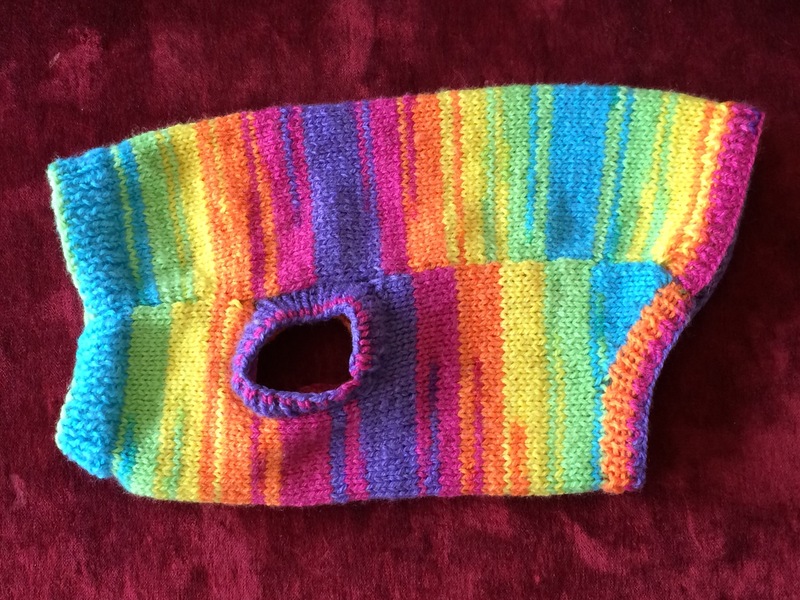 First Christmas Present Hot Off The Needles! 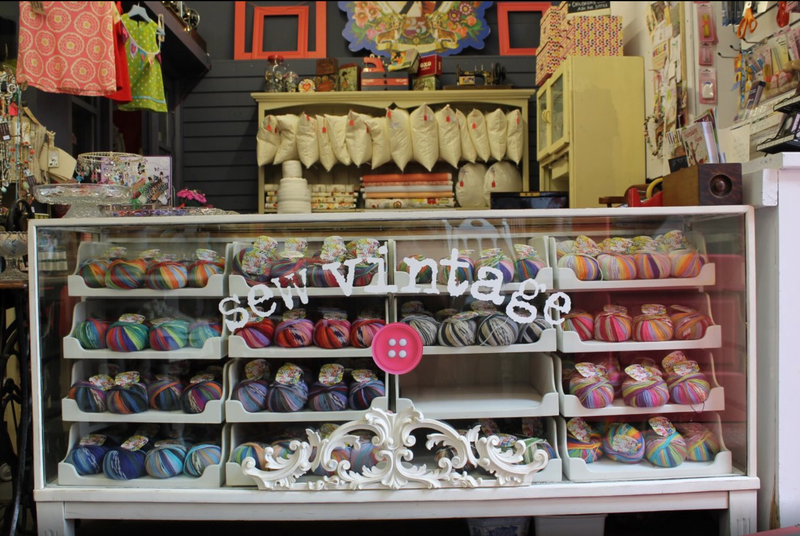 Exactly one month ago I popped into Sew Vintage in Wells, looking for nothing in particular and happy to just drool over all the lovely things on display. 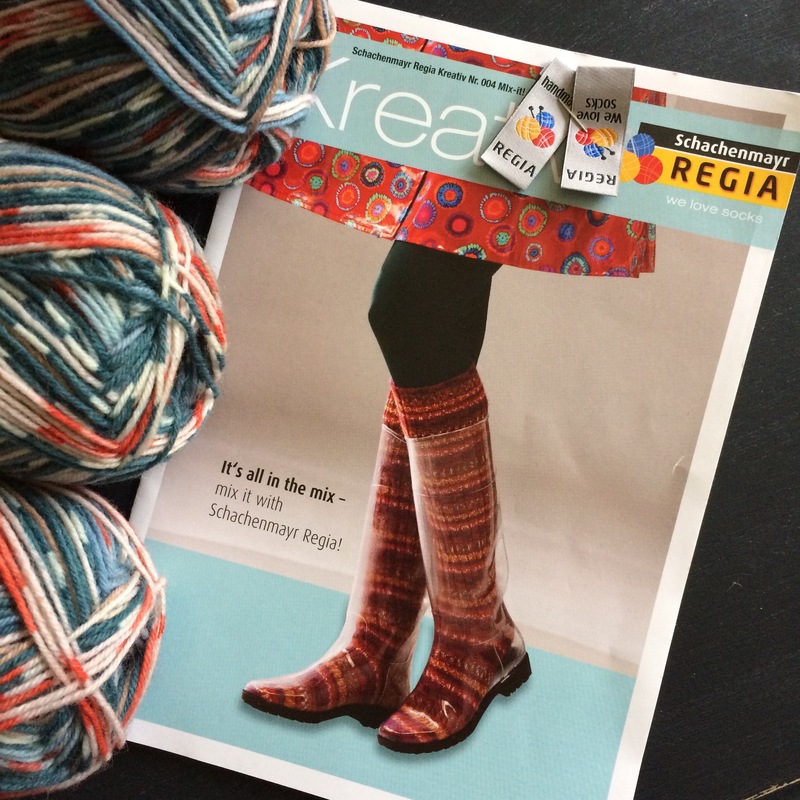 Amongst all the yarns, I spotted some lovely self striping “Regia” sock yarn, designed by Arne and Carlos for Schachenmayr. 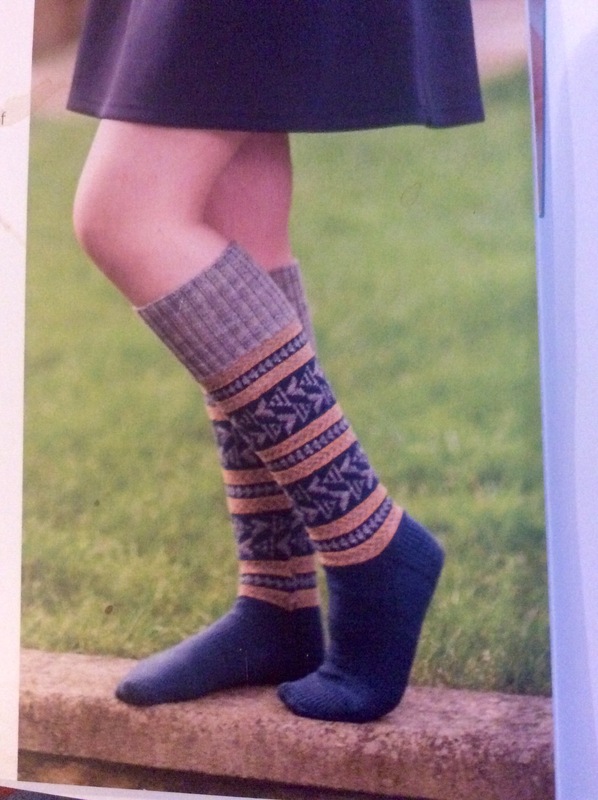 There was also a pattern for knee-high socks complete with two labels to sew in to the finished socks. How cute? I couldn’t resist it, so bought both the pattern and four balls of yarn. 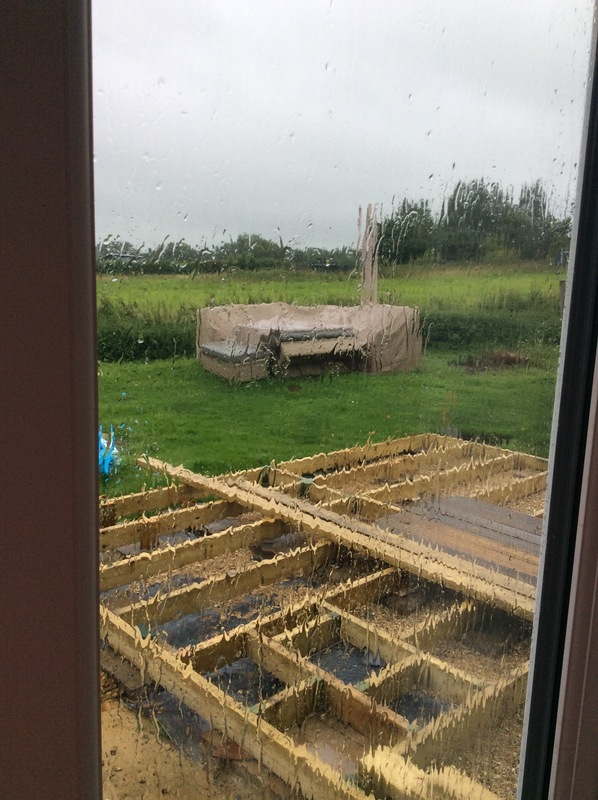 (I still can’t find any see-through wellies, though!). When I got home and put on my glasses to read the pattern, I discovered that it was written for DPNS – and I only know how to use circulars. 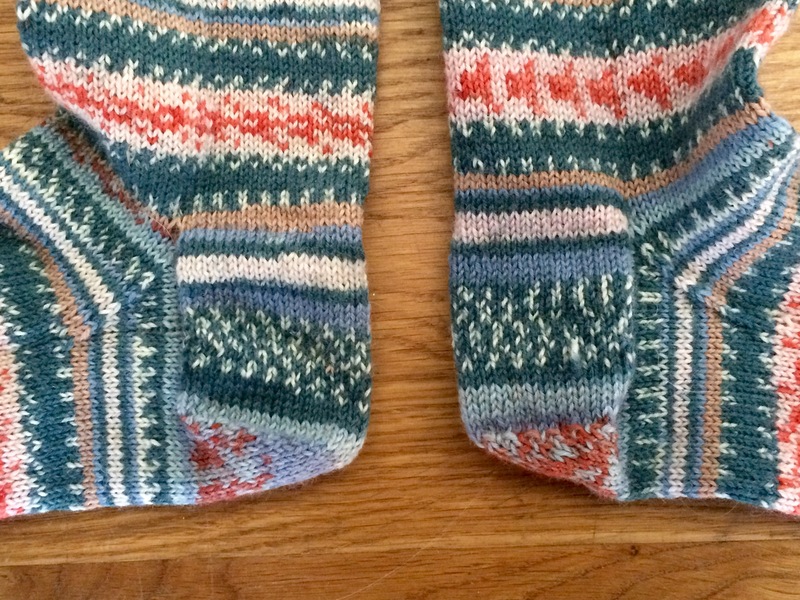 To be honest, I think I would have had a go on circulars if the instructions had been more straightforward, but they seemed overly complicated to me so I chose a pattern from “Coop Knits Socks”, by Rachel Coopey. 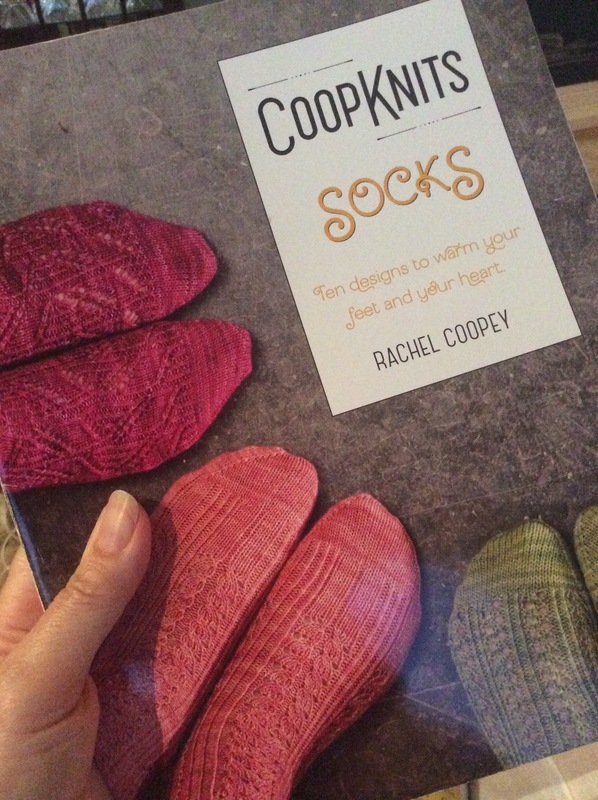 I bought this book at Yarndale a couple of years ago and have made several different pairs from it already. 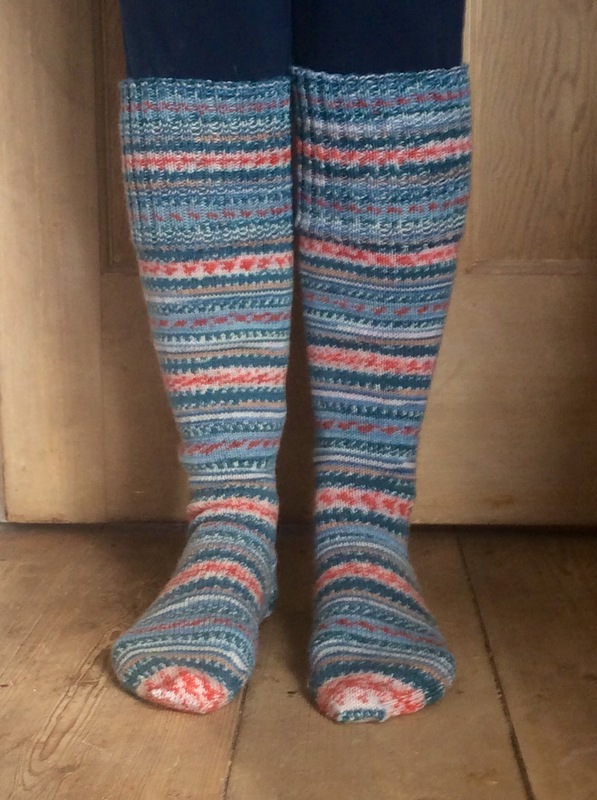 These are the “Brighton” socks and feature a stunning fair isle design in three colours. 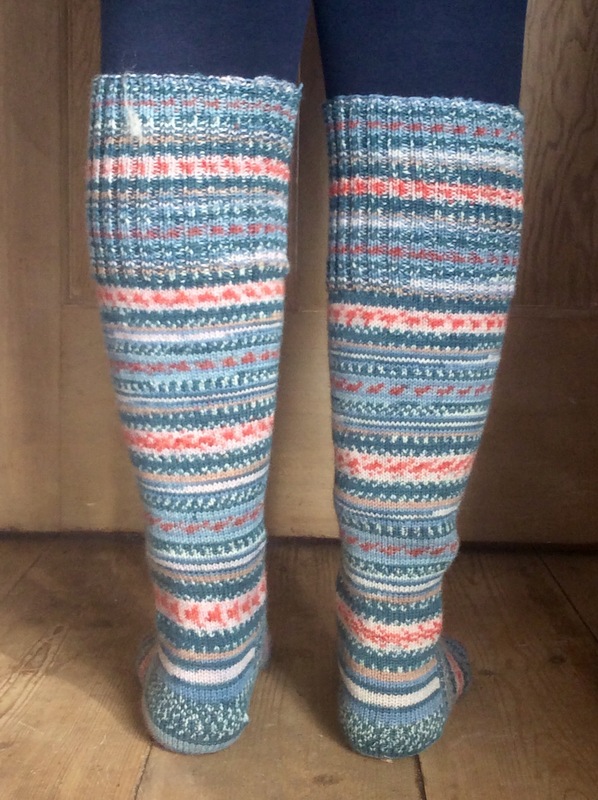 I decided to follow the pattern for construction without following the charts for the colourwork, so the style would be the same minus the fair isle – knee-high socks with a deep ribbed cuff. That evening, I cast on using the long-tail method as usual for a nice, stretchy top. 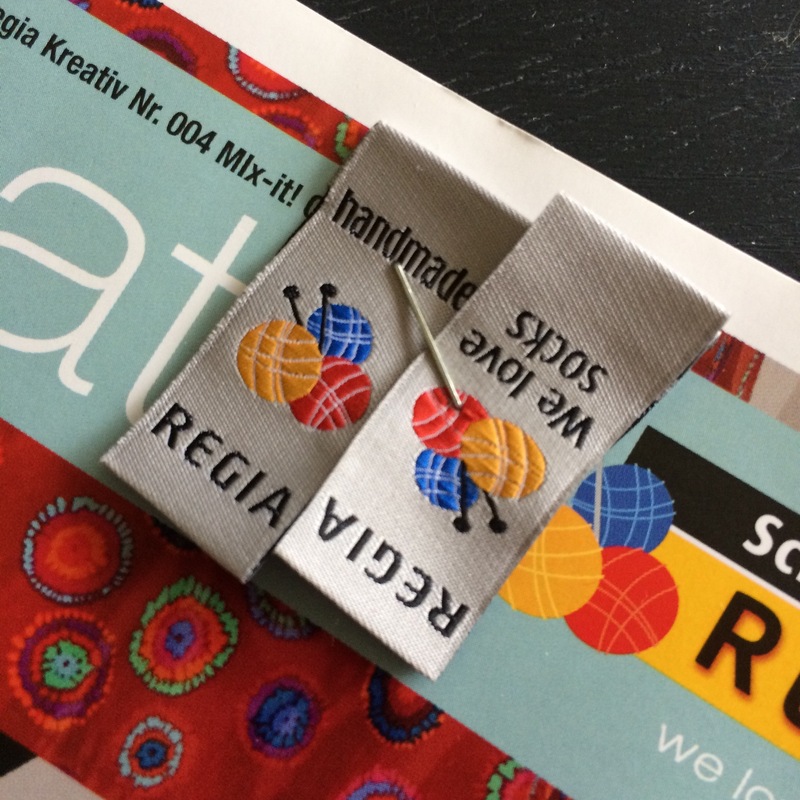 I love my row counter which was gifted to me in a Stitching Santa parcel last year – it makes keeping track of where you are a piece of cake. 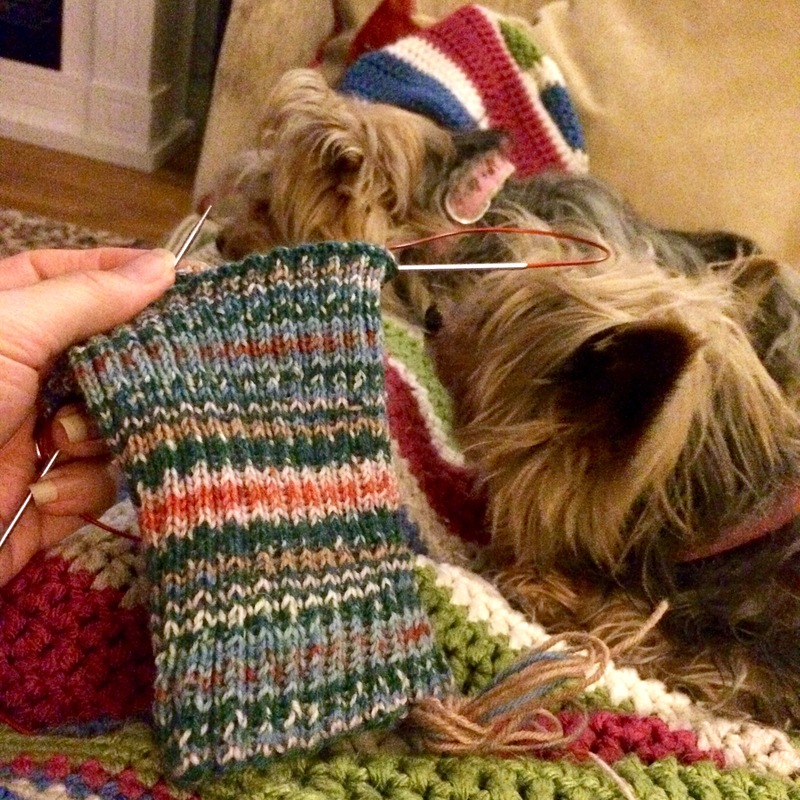 Of course, The Dogs like to be close by when Mummy’s knitting at night. I’ve taken these in the car with me whilst The Boys play football. 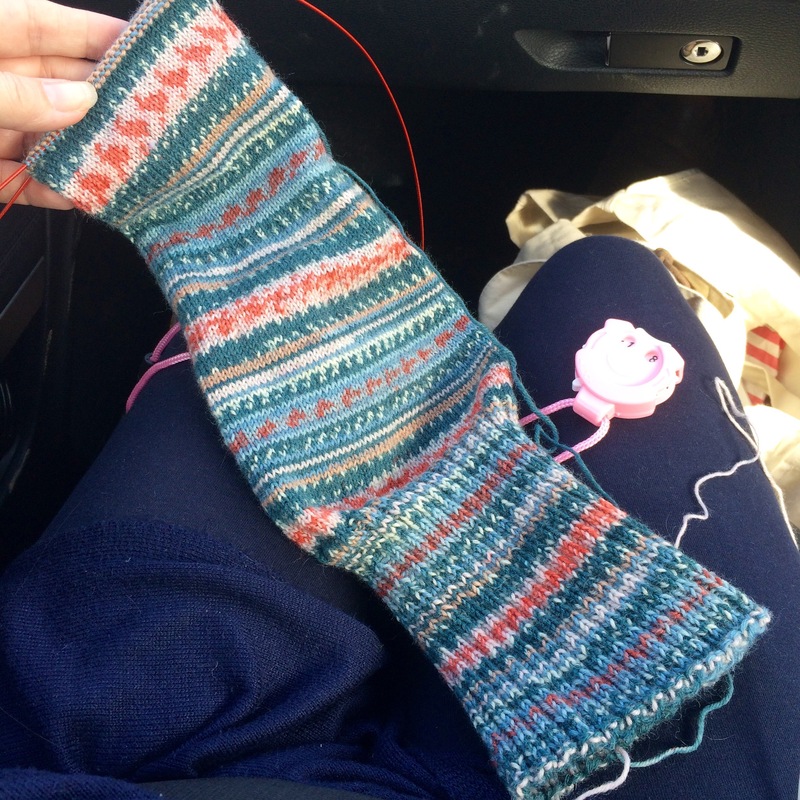 I love that socks are such a portable project. I also LOVE this yarn! 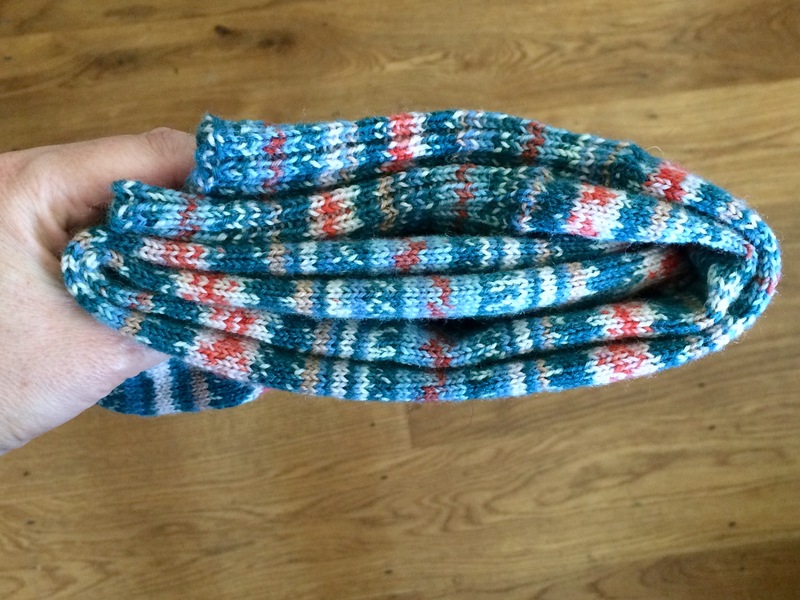 The body of the sock is in stocking stitch and just look at how different the stripes look from the deep ribbing. The combination of colours are really lovely, too, and they’re quite accurate in this photo. I tried it on for size just before I started turning the heel and this is when I noticed just how good the yarn is. 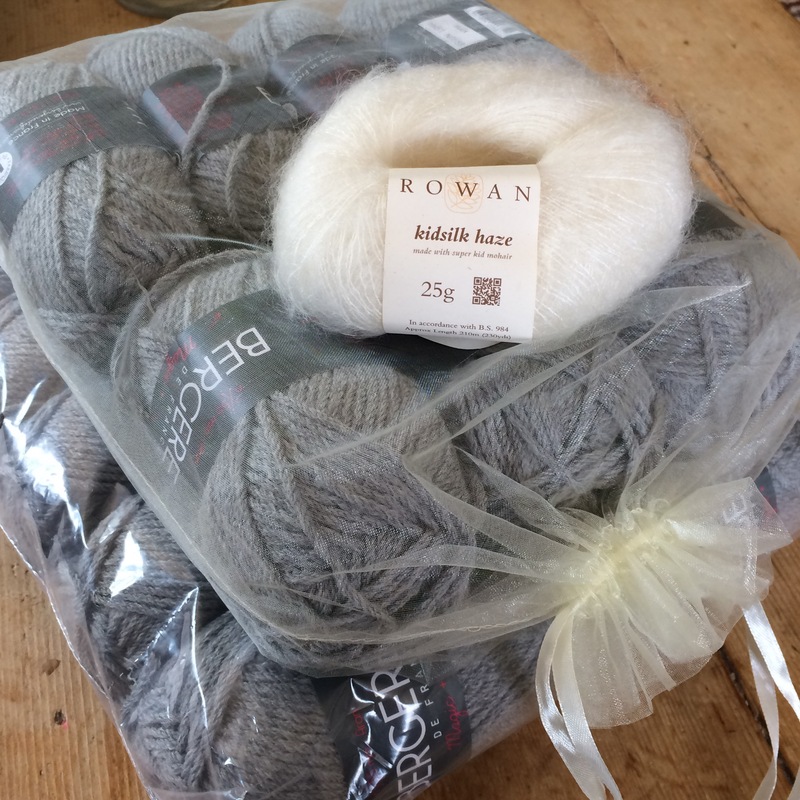 It’s quite expensive at £5.49 a ball, meaning that this pair cost £22.00 to knit, but they feel expensive, too, and surprisingly soft for such a high wool content (75% wool, 25% polyamide). As they are destined to be a Christmas present I felt it was worth it, especially after feeling how nice they felt against the skin. 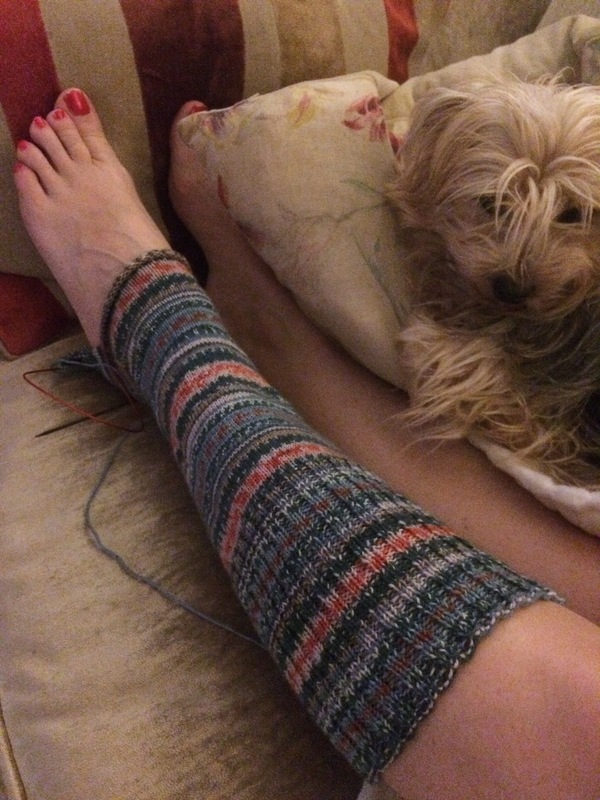 One sock down and the second one almost finished, when I made a mistake and had to frog a whole evening’s work back. Poo! 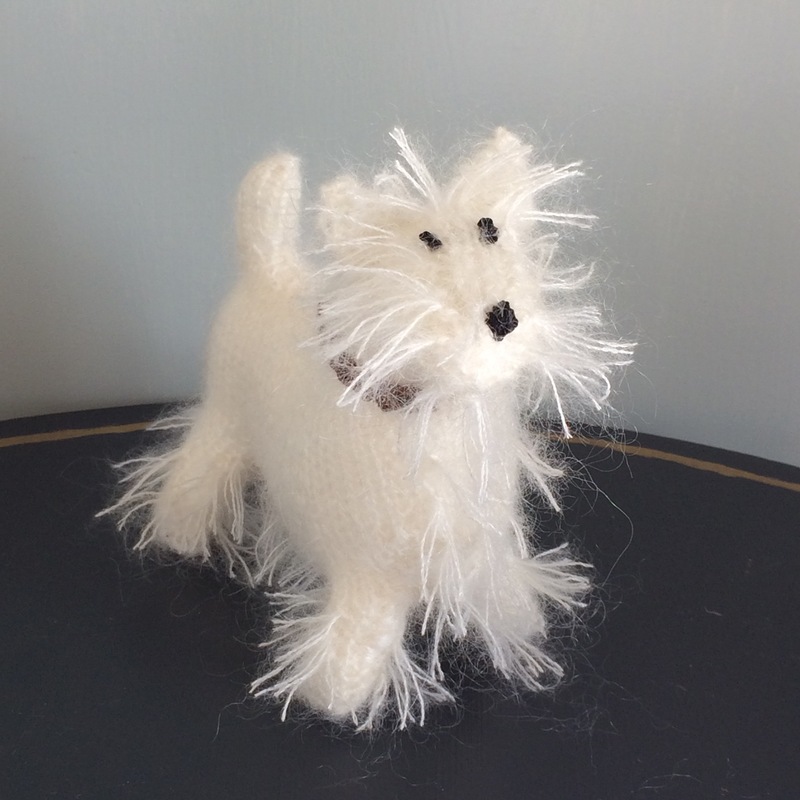 Finally finished and ready to put away for Christmas – my first present made and it’s not Easter yet! 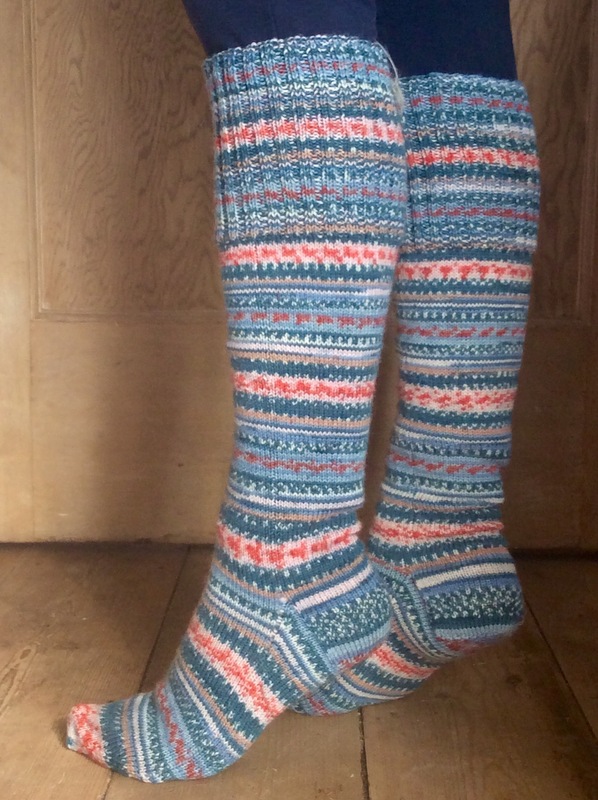 I’ve a feeling they’ll be worn over trousers as welly socks, hence my modelling them as such. I’m very happy with the pattern matching as it can be tricky to find the exact spot in the ball at which to start the second sock. As with all Rachel’s socks, the fit is absolutely perfect. 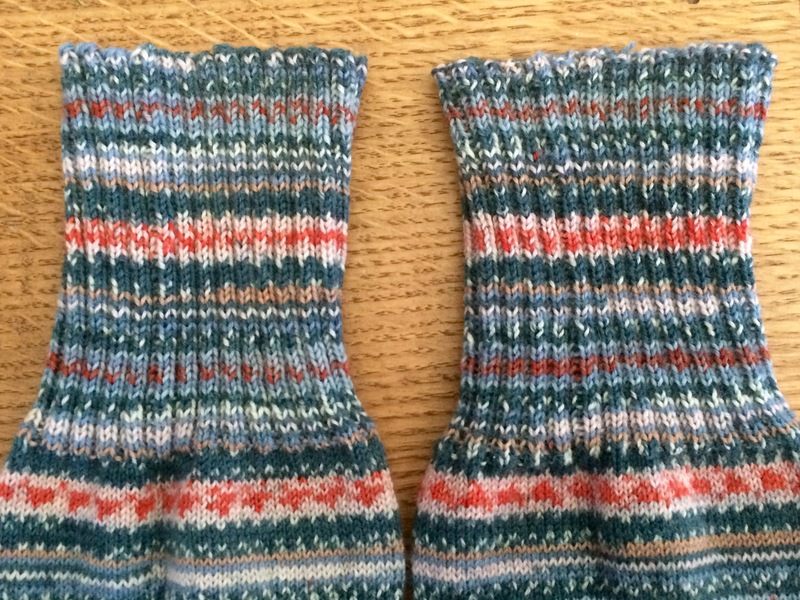 The extra deep ribbing will mean that the socks will hug the leg without slipping down. Nice neat heels – the frogging was worth the effort! 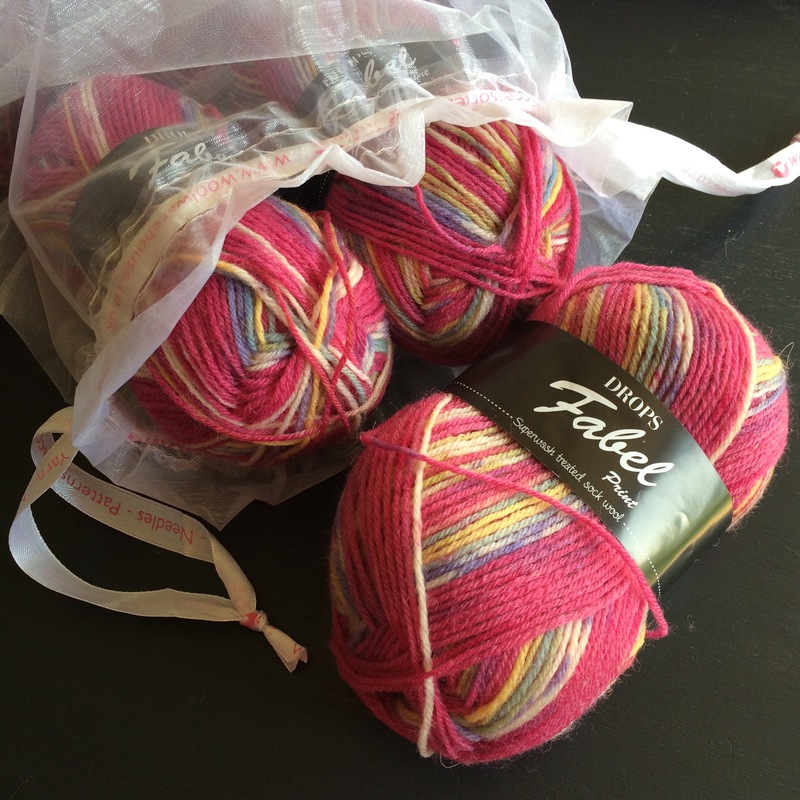 Next up, some pink ones – another Christmas present in the making, but with some much cheaper yarn. I wonder if I’ll regret it…? Categories: Knitting | Tags: arne, carlos, Christmas, gift, hand knitted, handmade, knitting, present, regia, socks | Permalink.